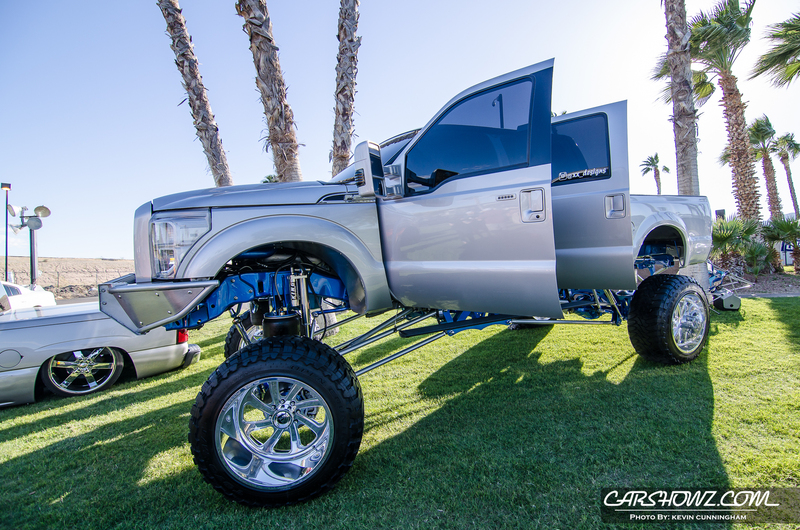 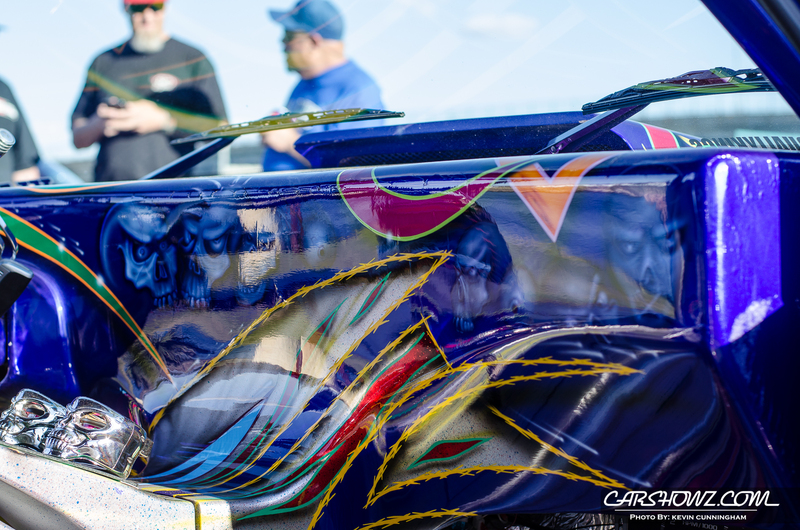 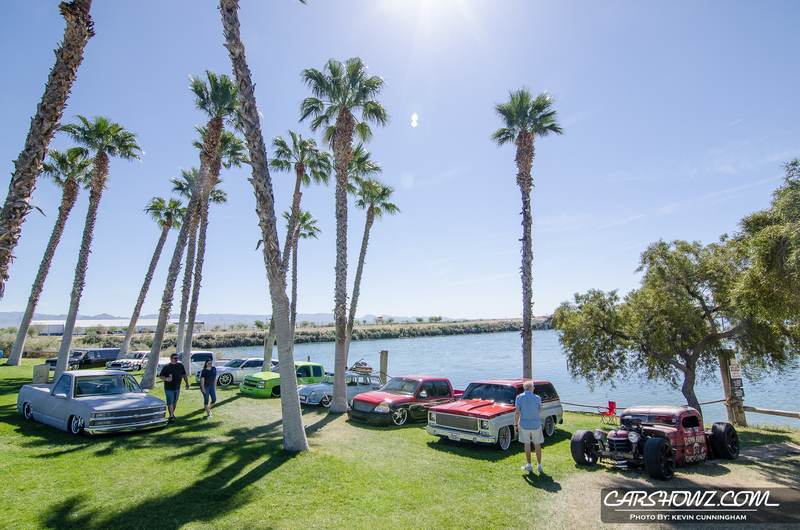 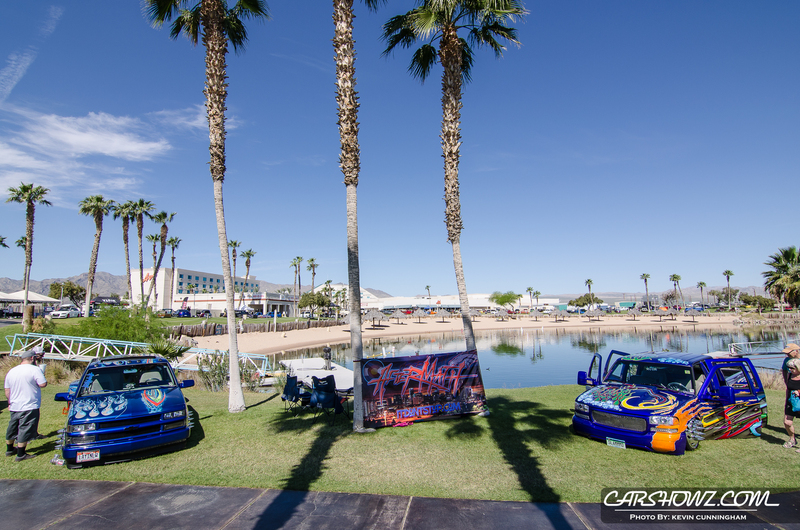 Forbidden Fantasy Show N Shine 2017 is just around the corner and is being hosted in Laughlin, Nevada on March 31 through April 2. 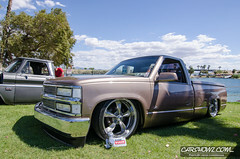 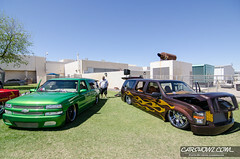 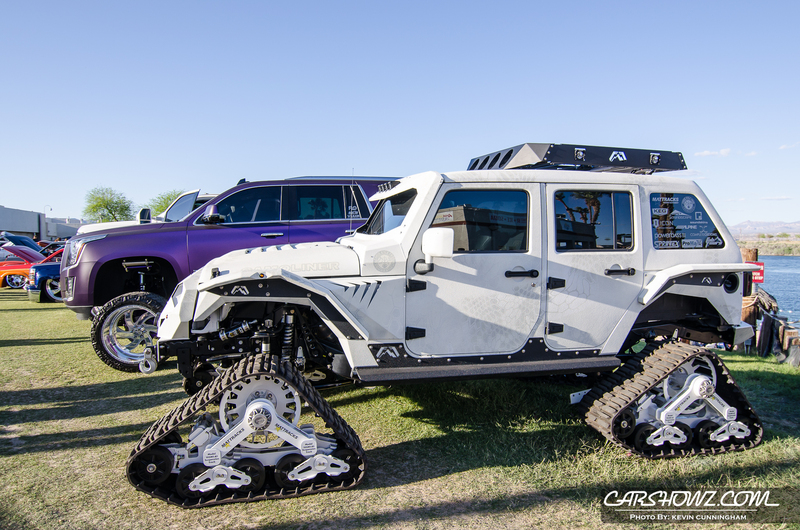 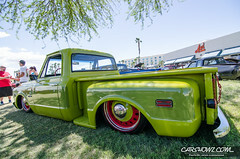 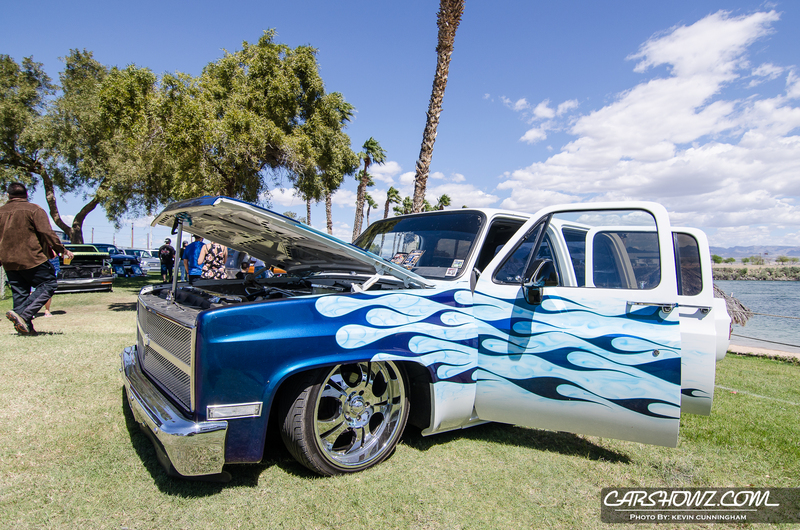 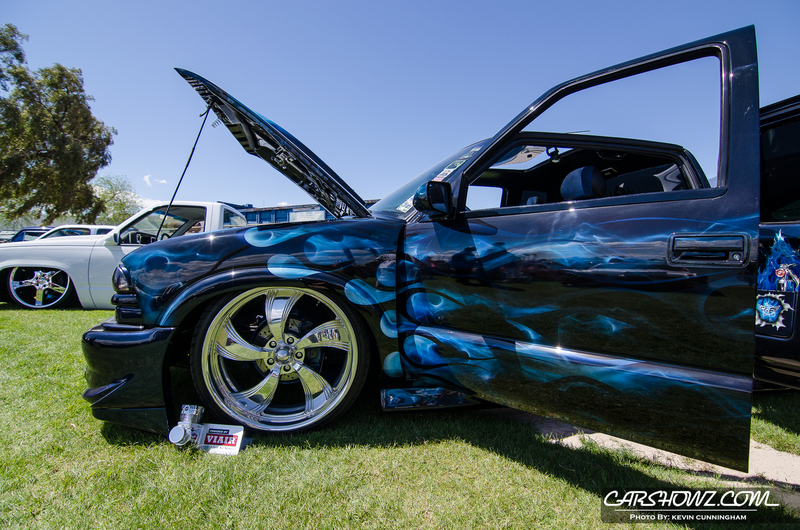 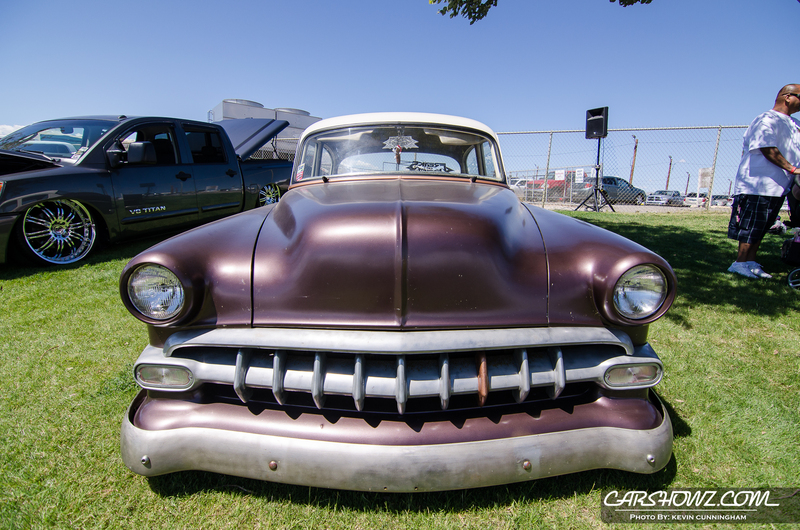 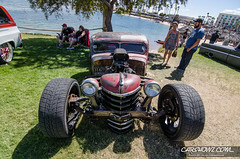 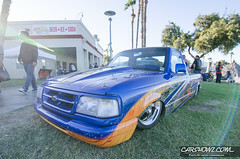 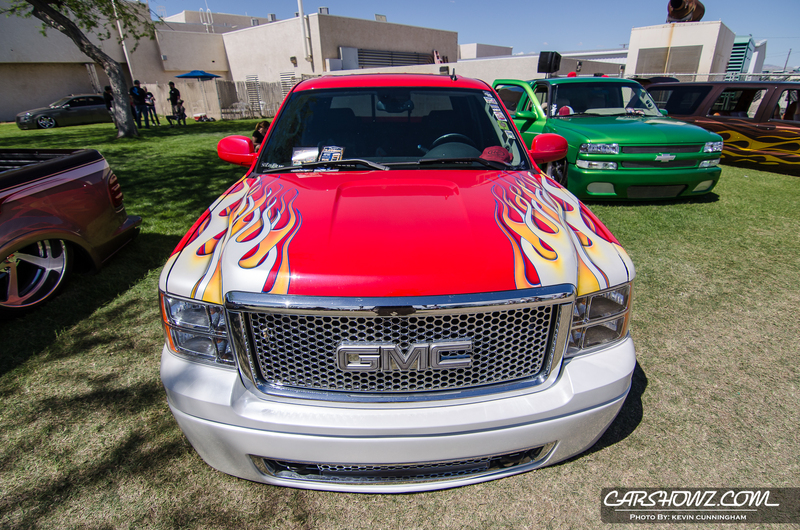 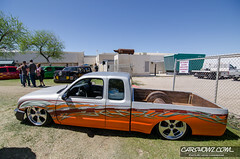 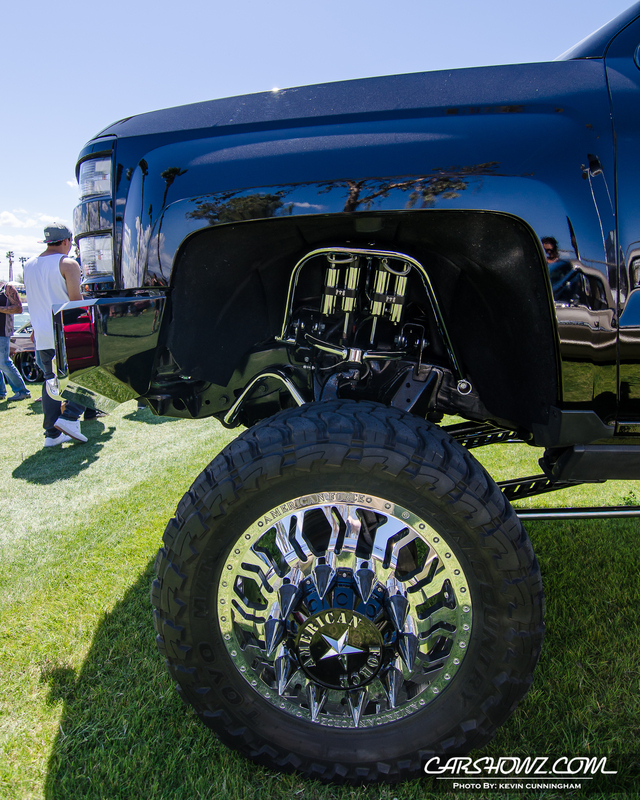 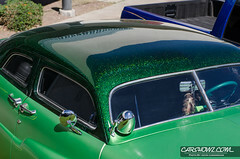 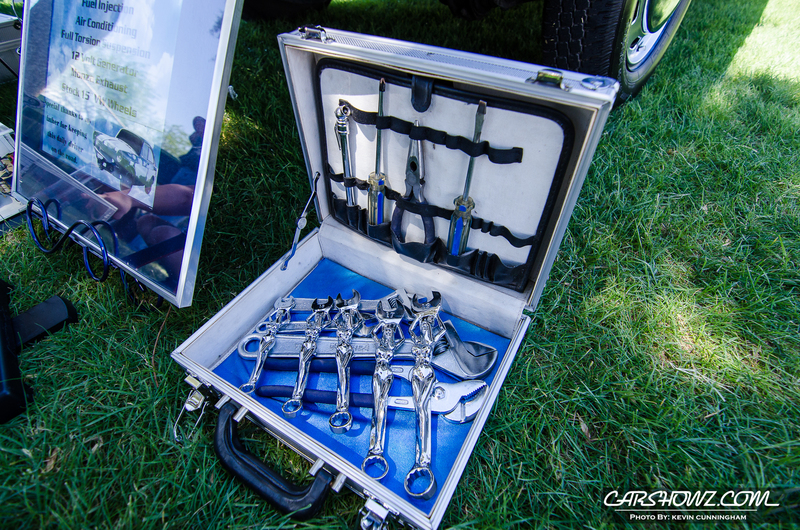 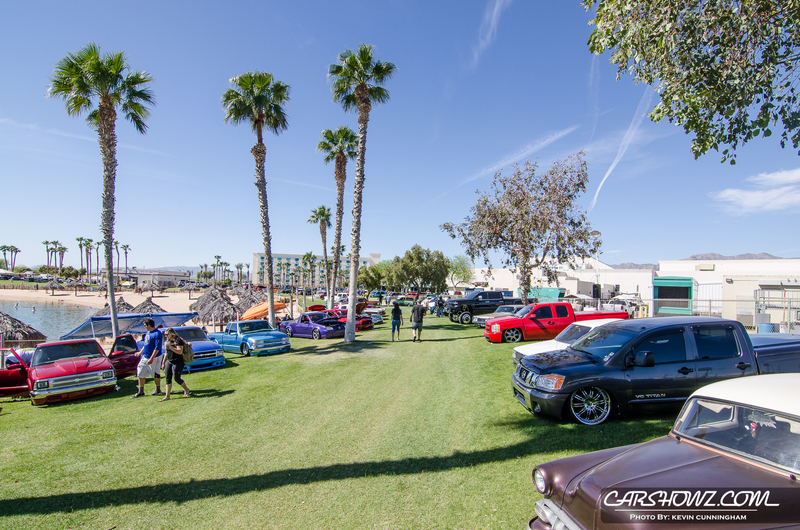 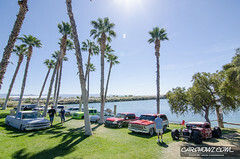 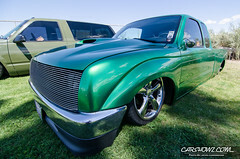 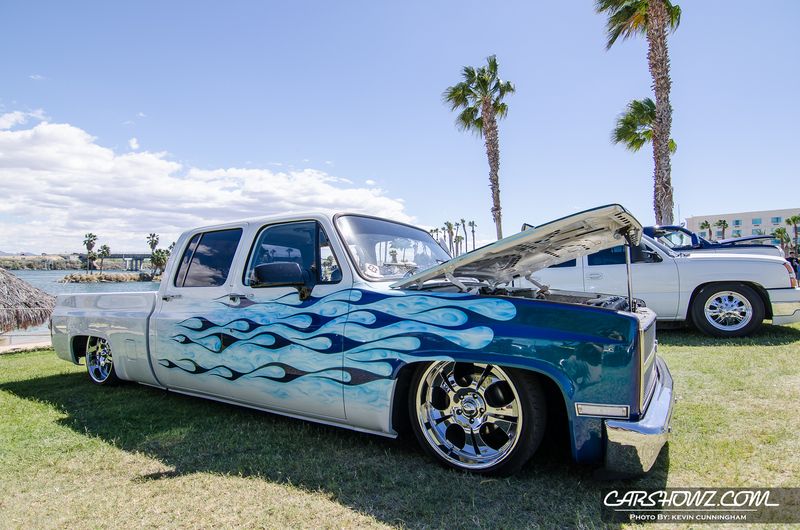 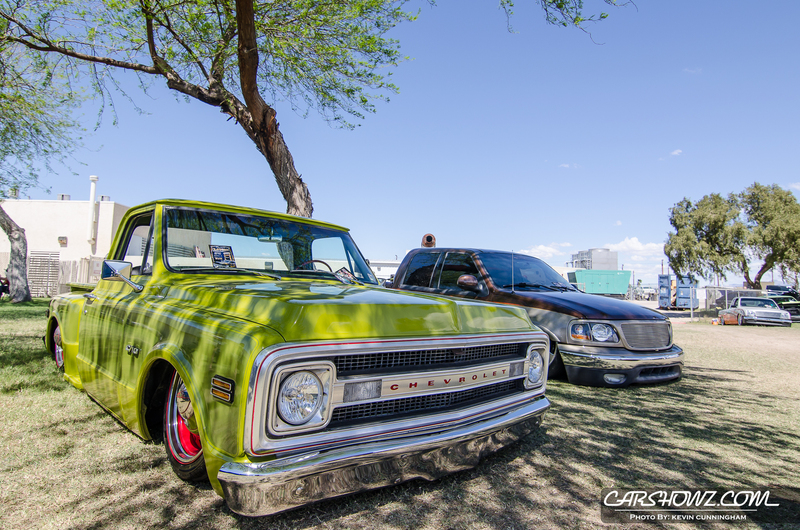 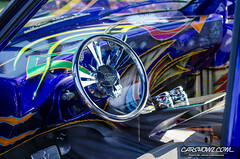 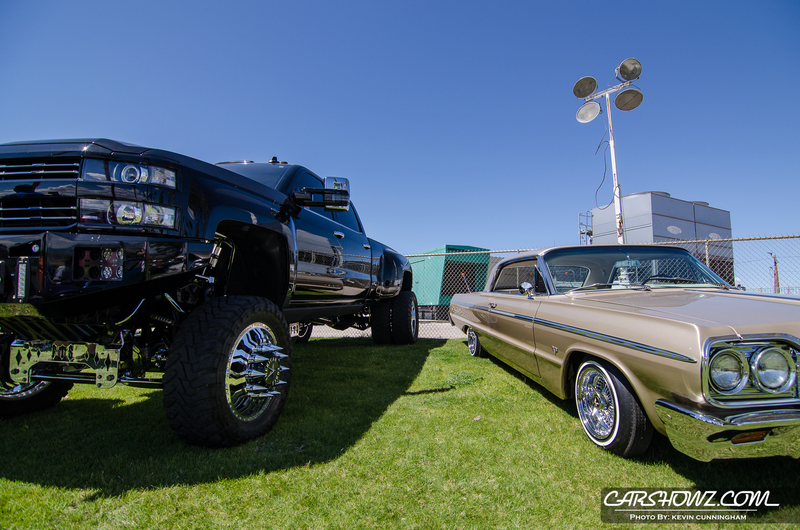 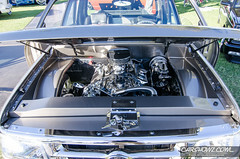 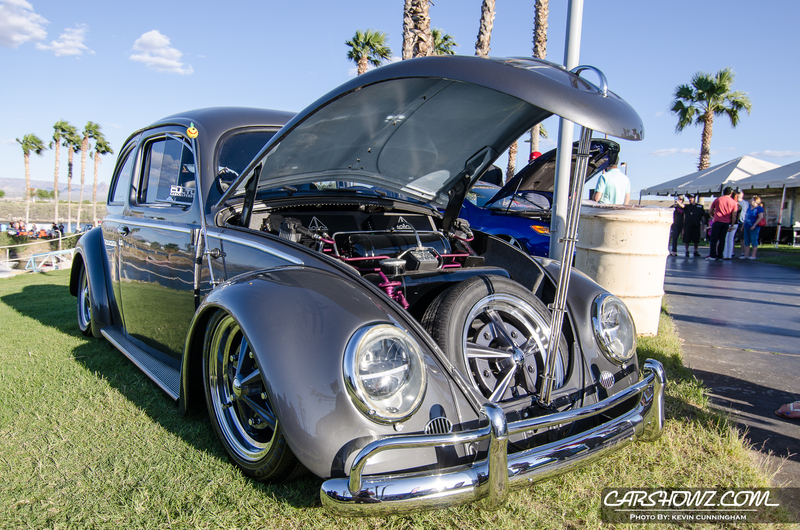 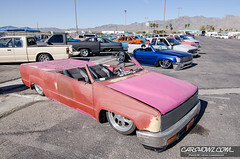 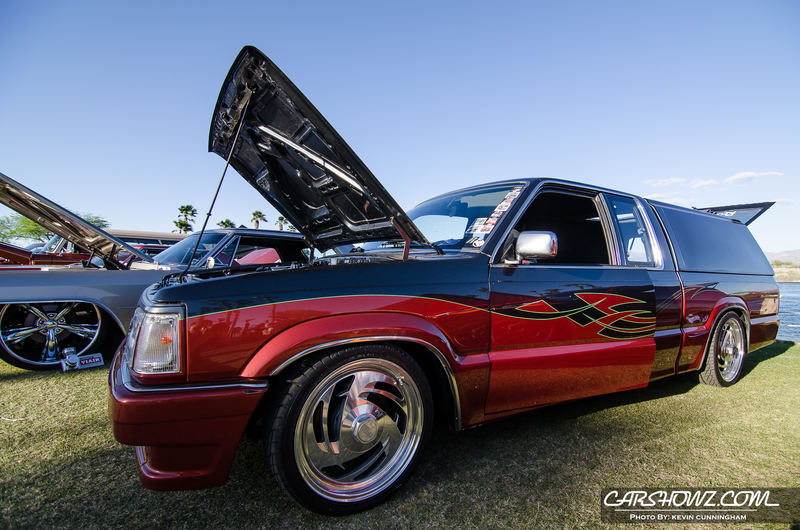 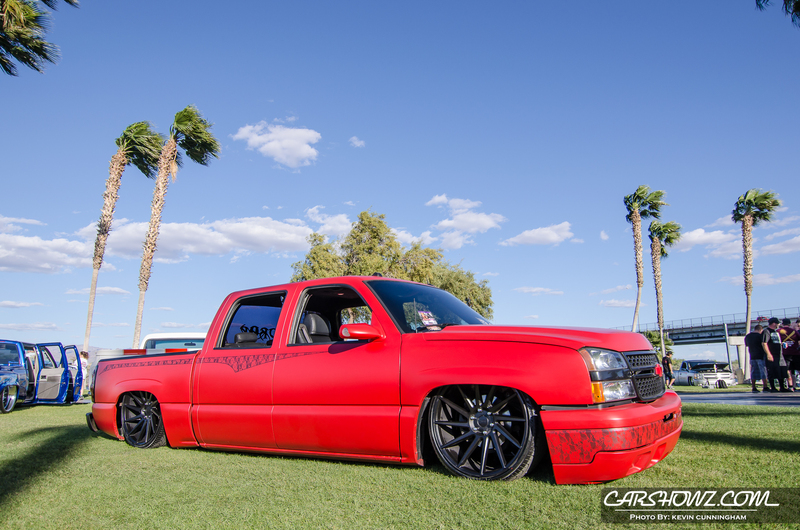 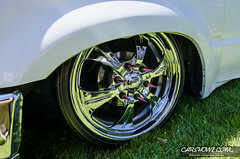 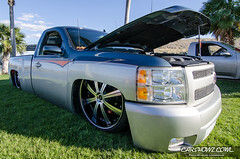 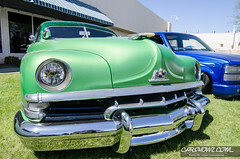 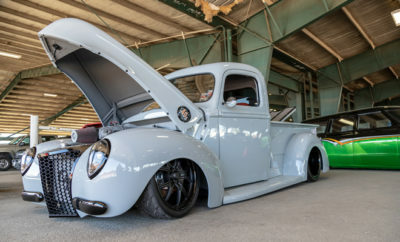 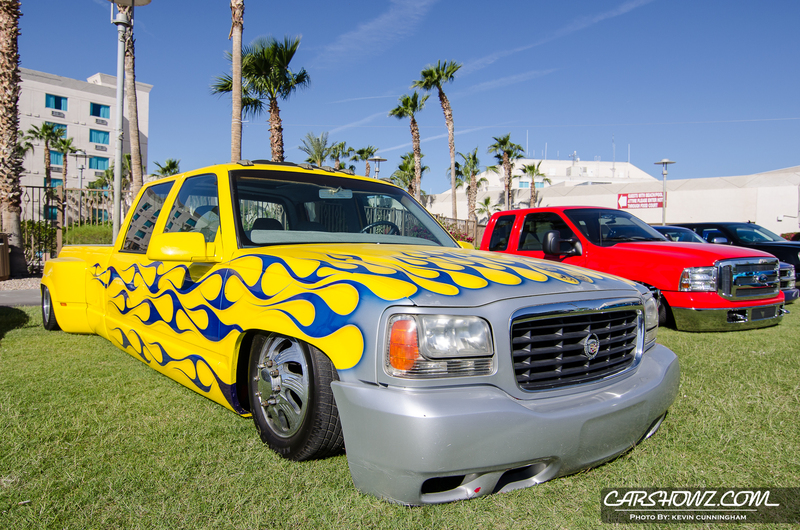 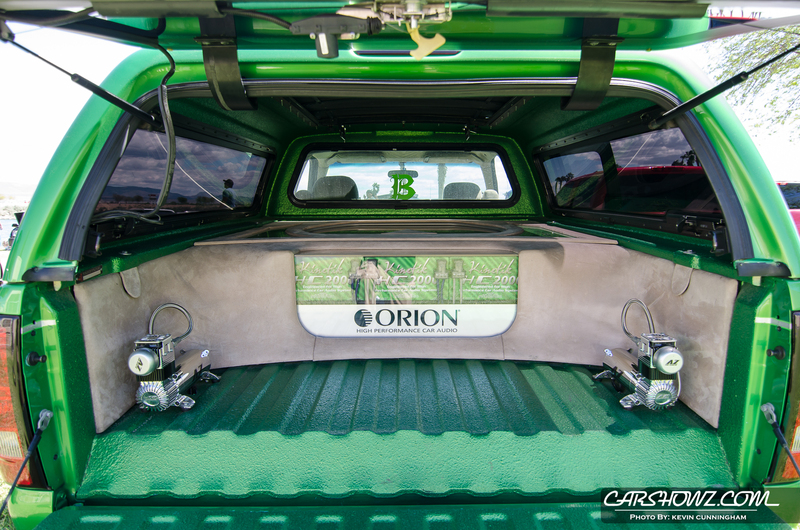 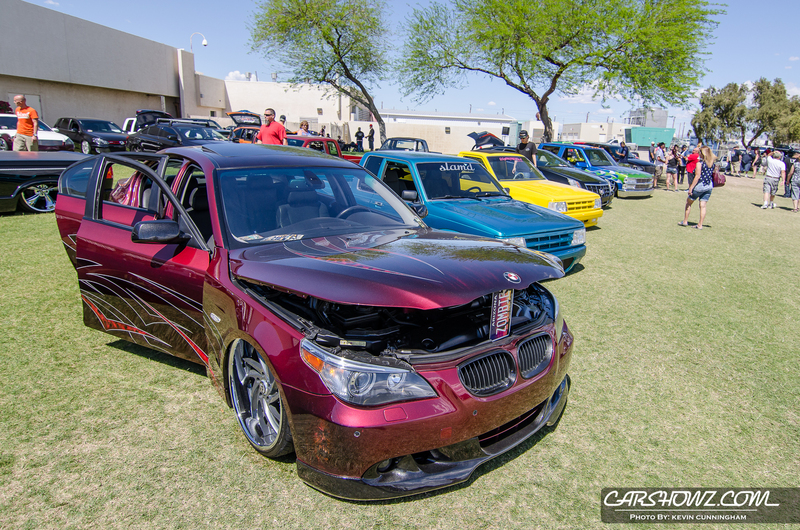 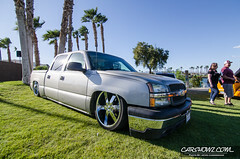 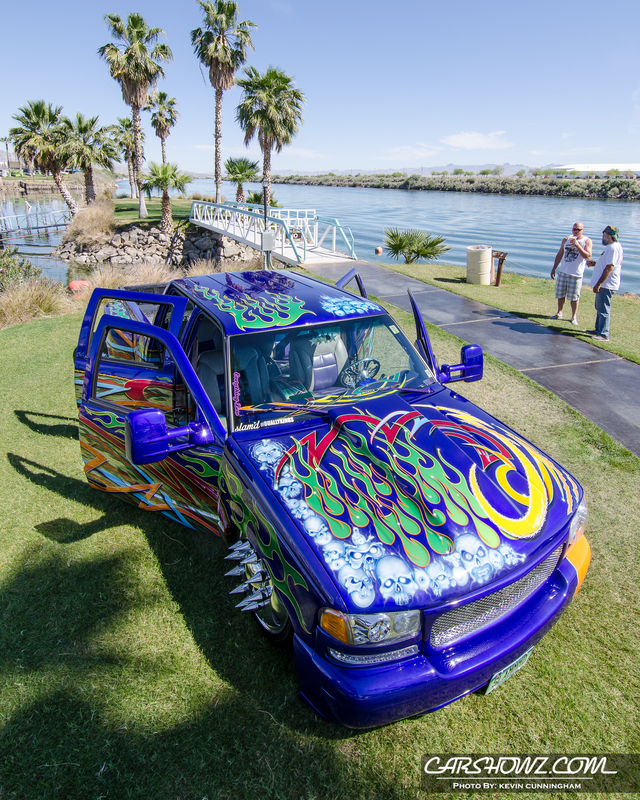 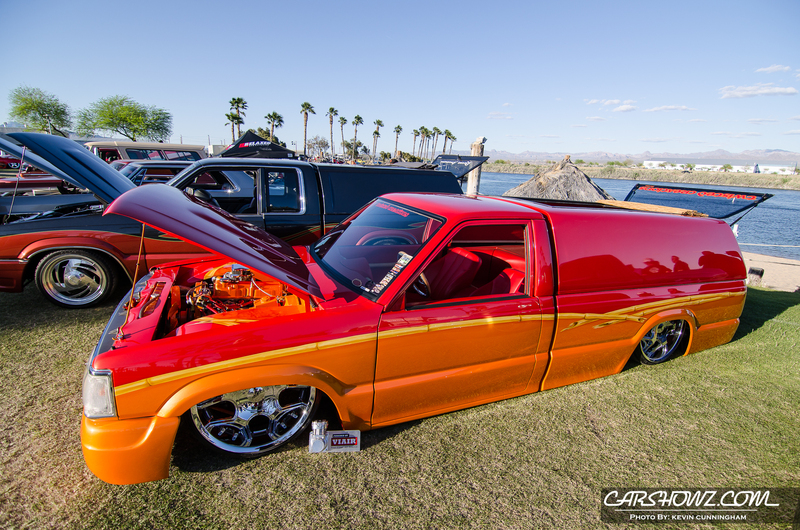 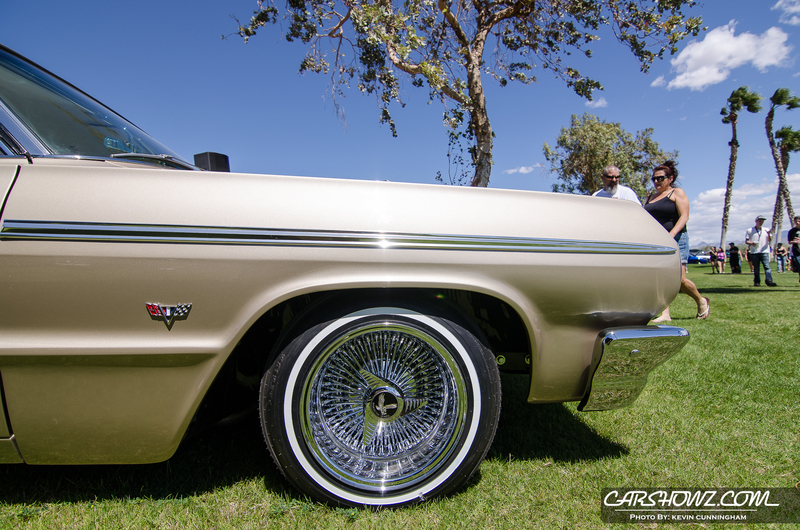 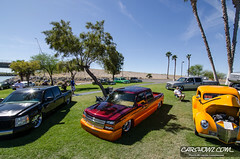 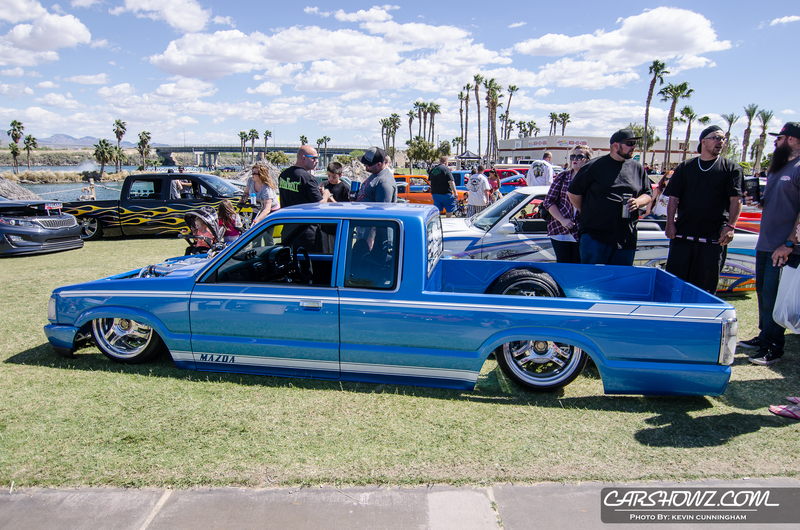 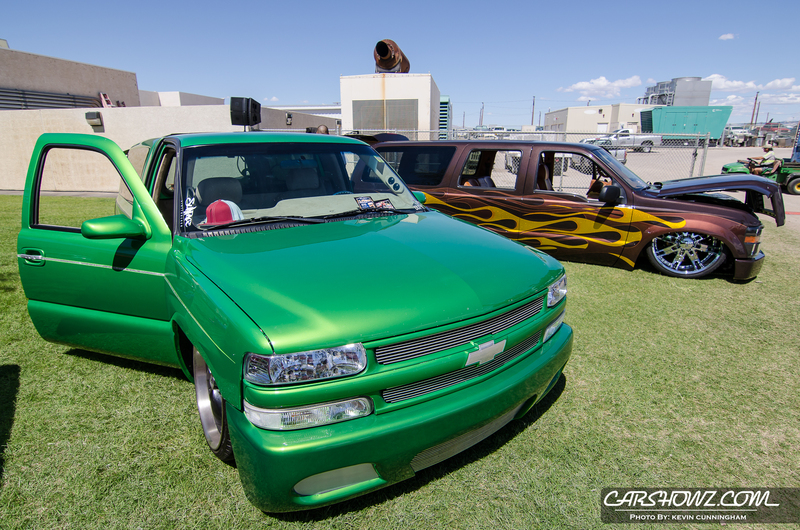 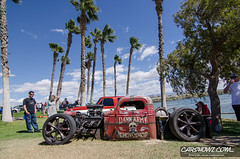 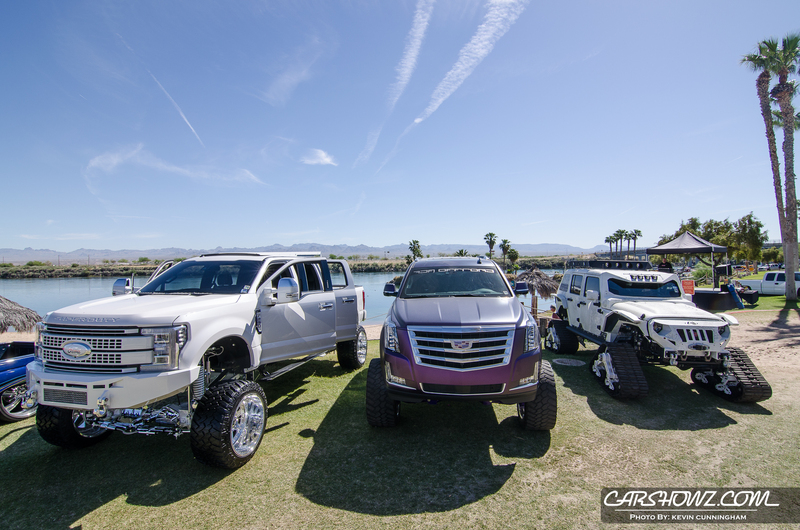 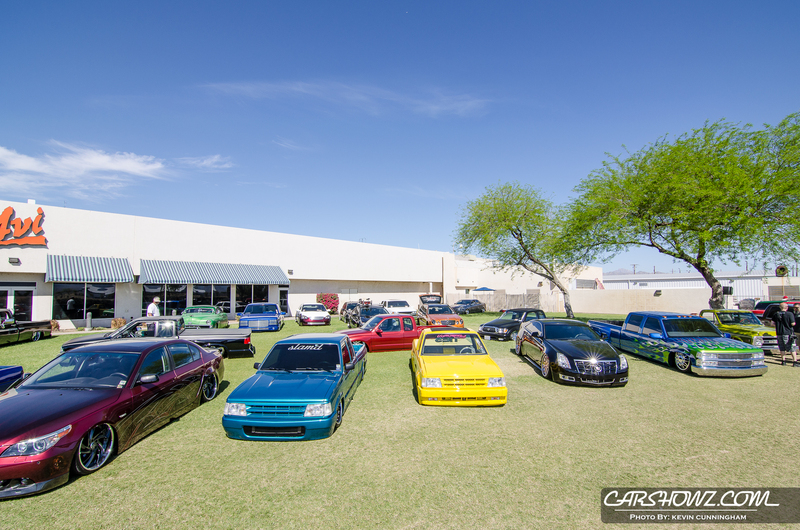 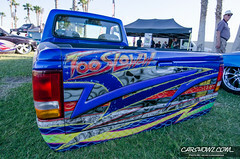 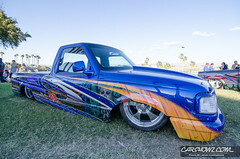 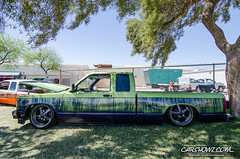 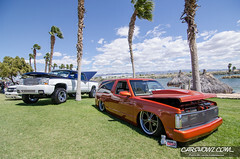 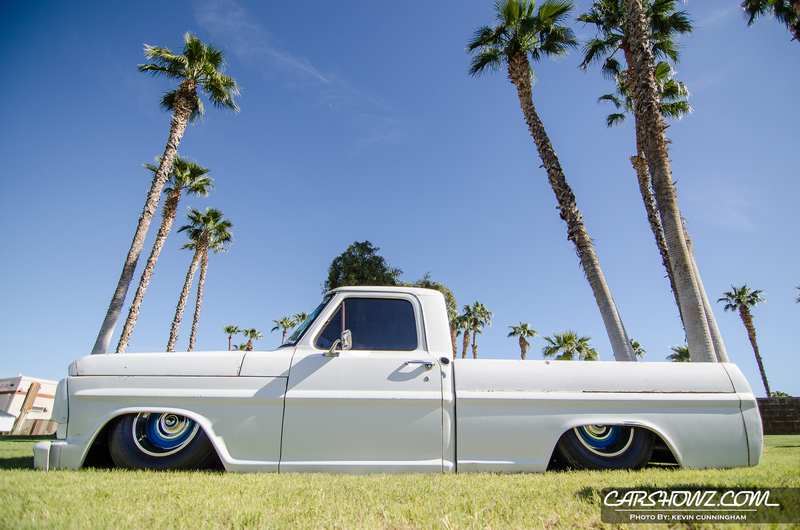 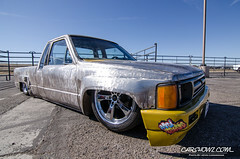 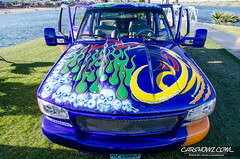 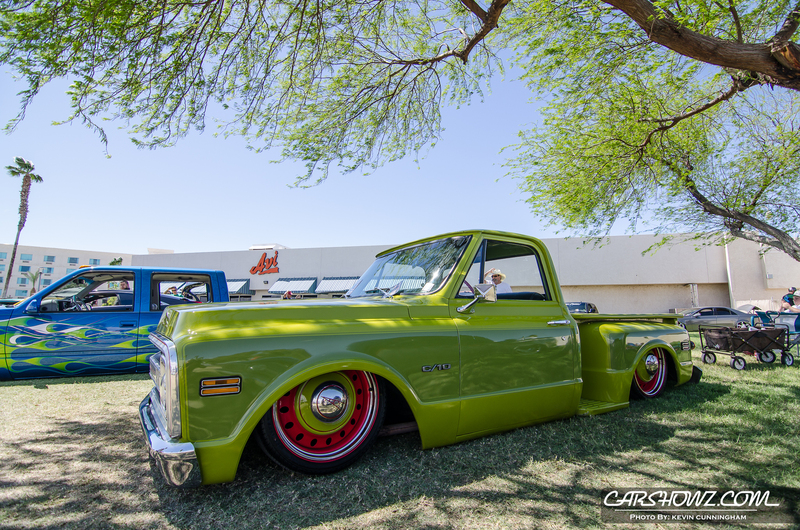 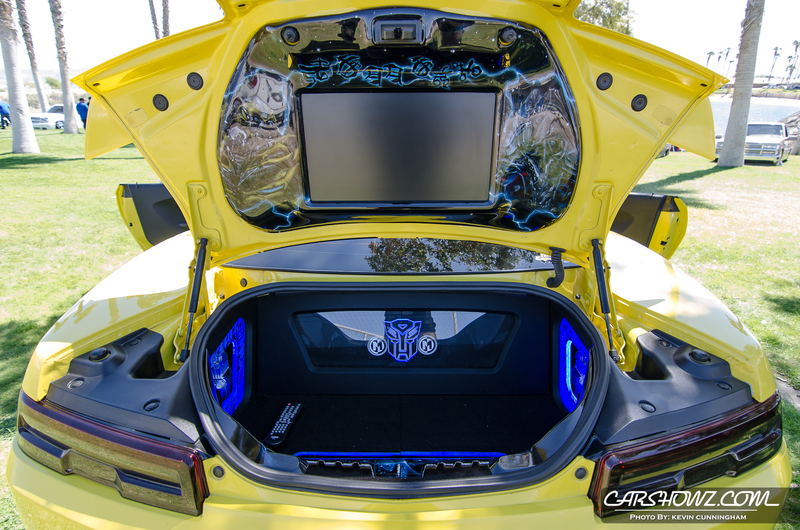 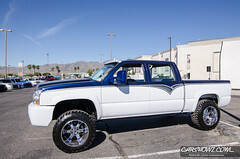 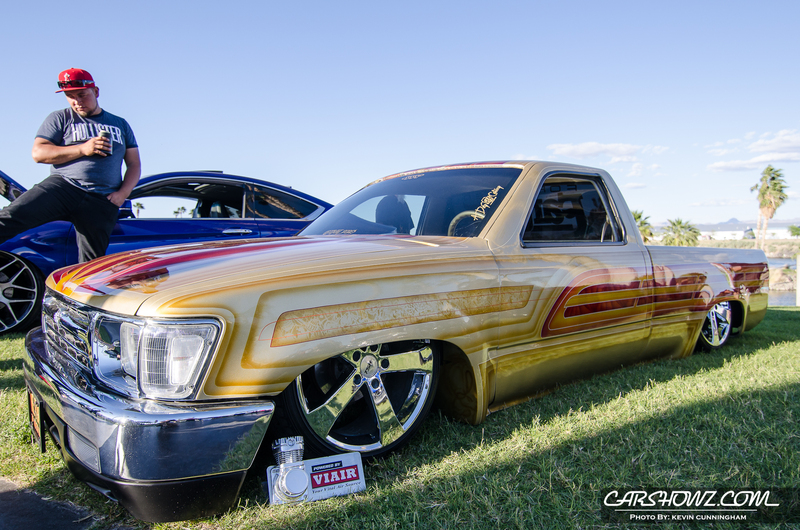 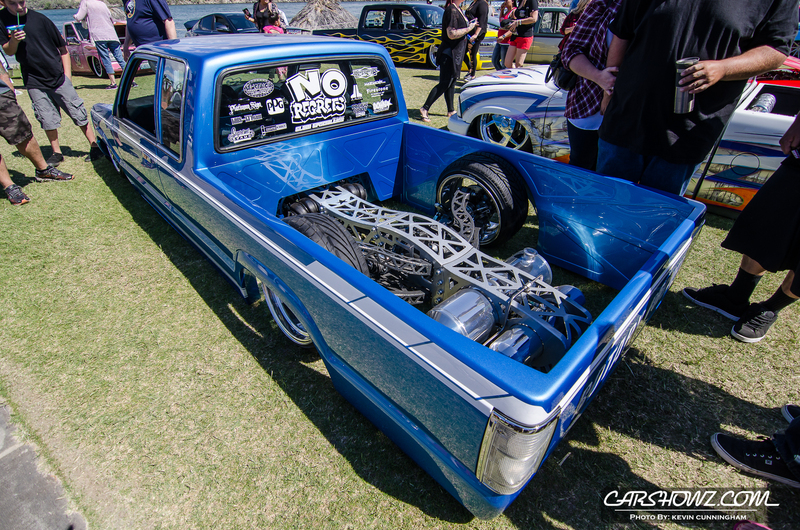 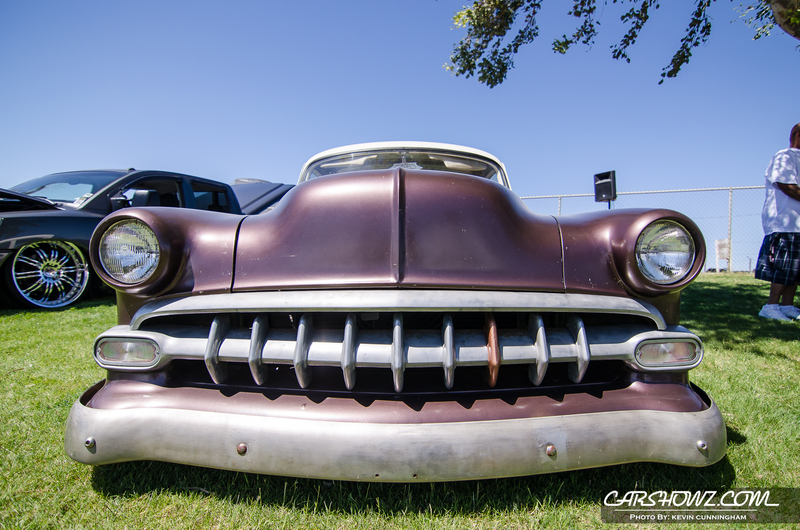 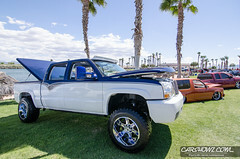 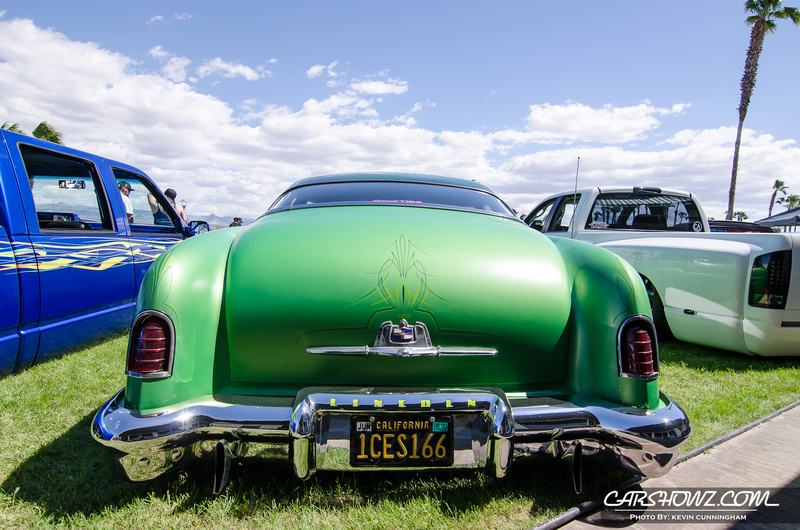 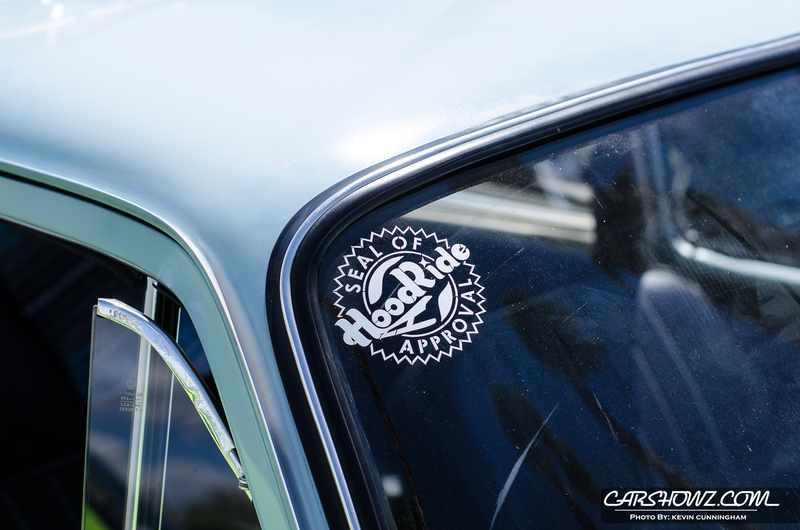 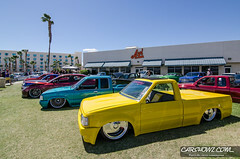 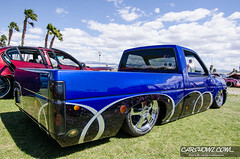 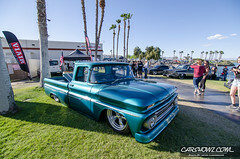 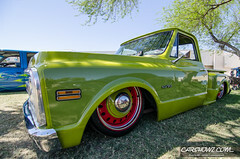 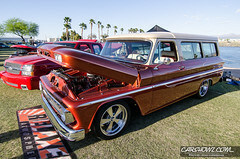 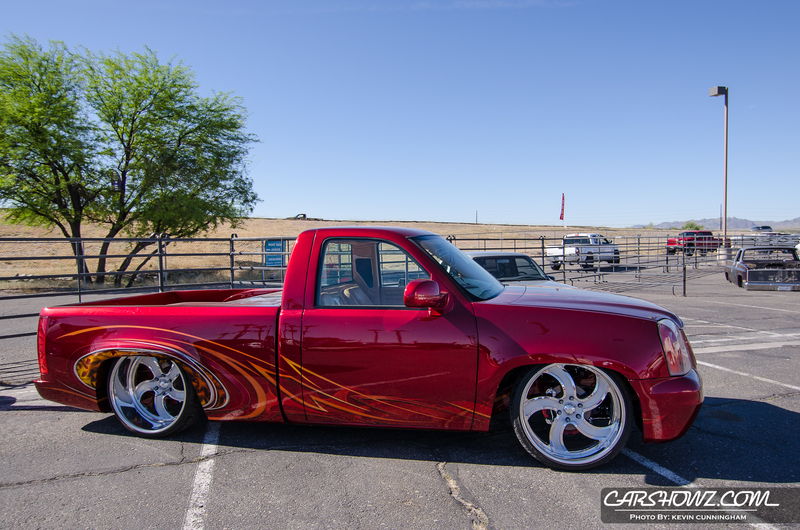 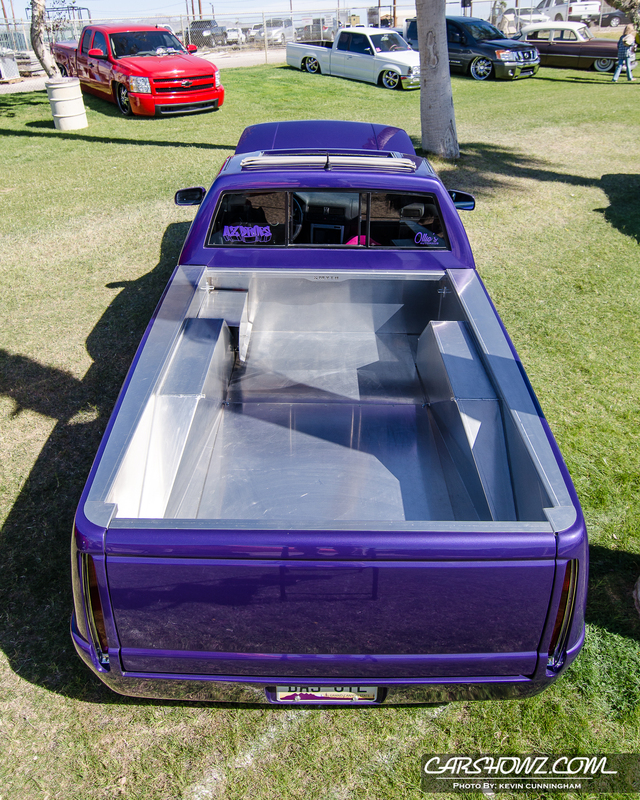 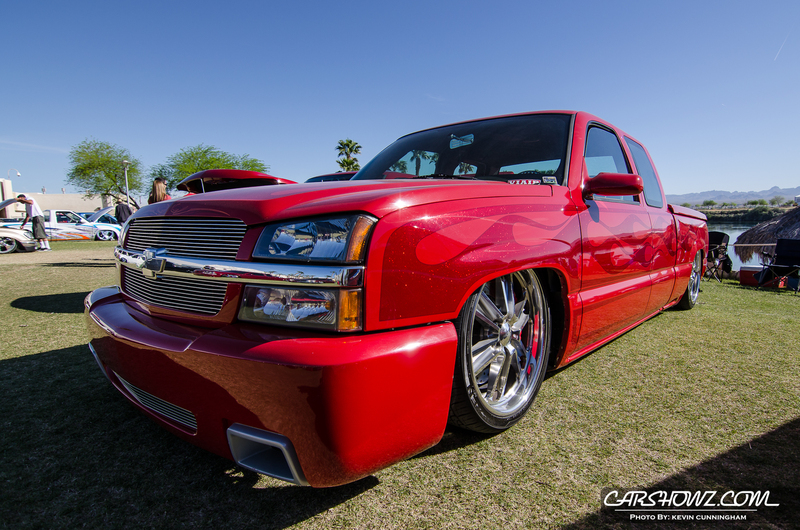 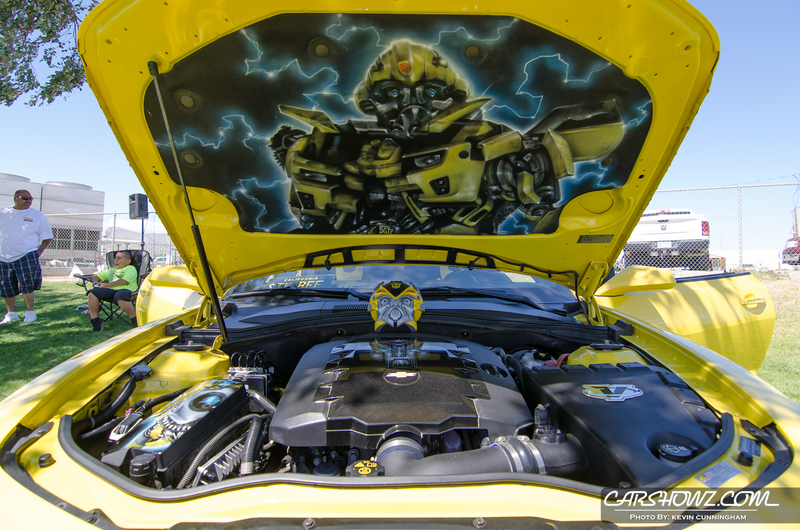 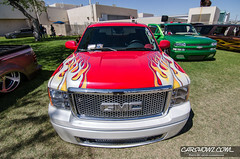 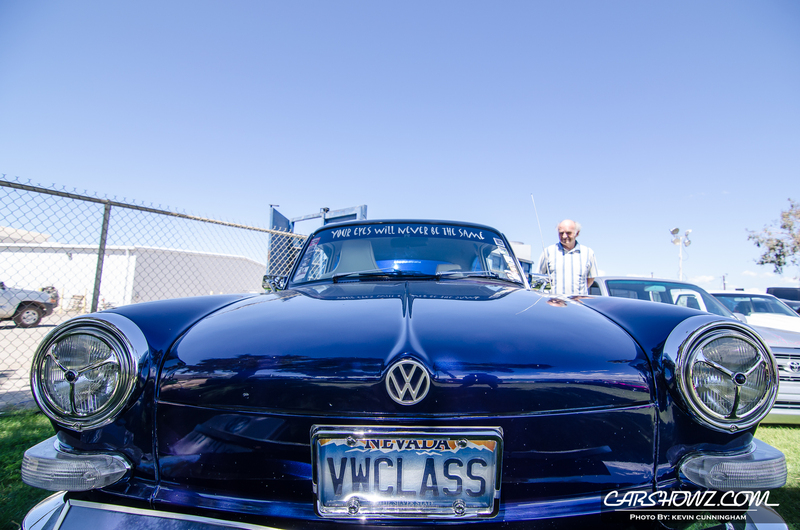 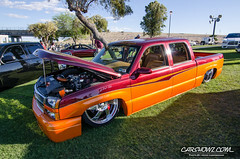 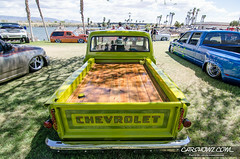 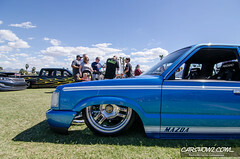 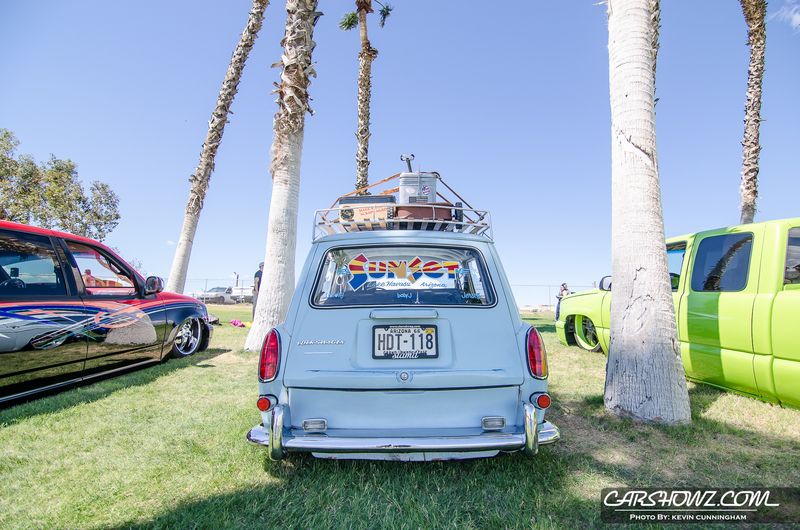 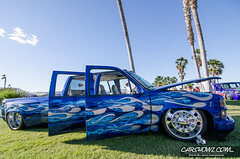 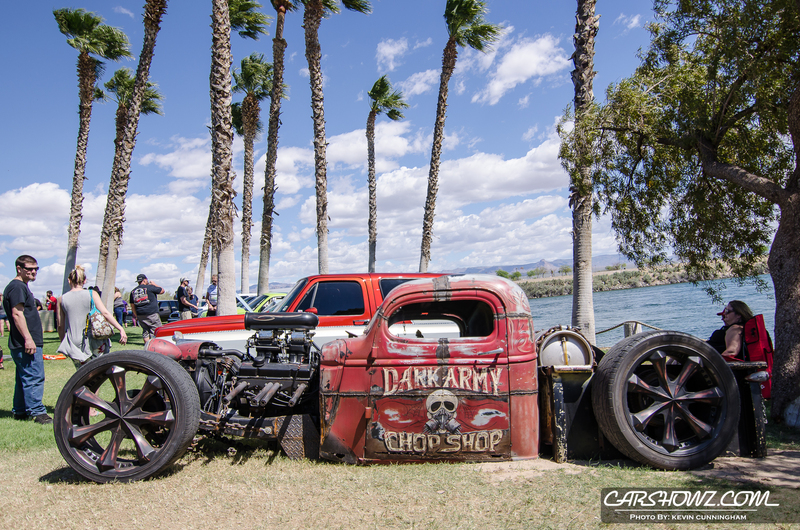 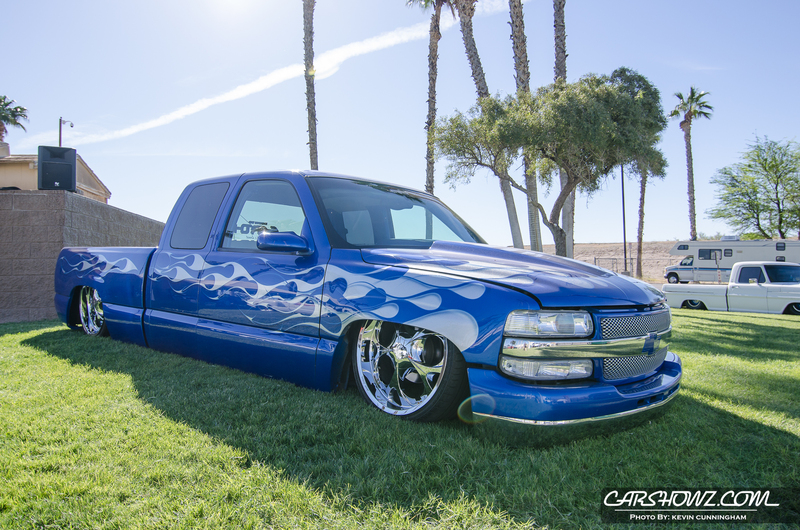 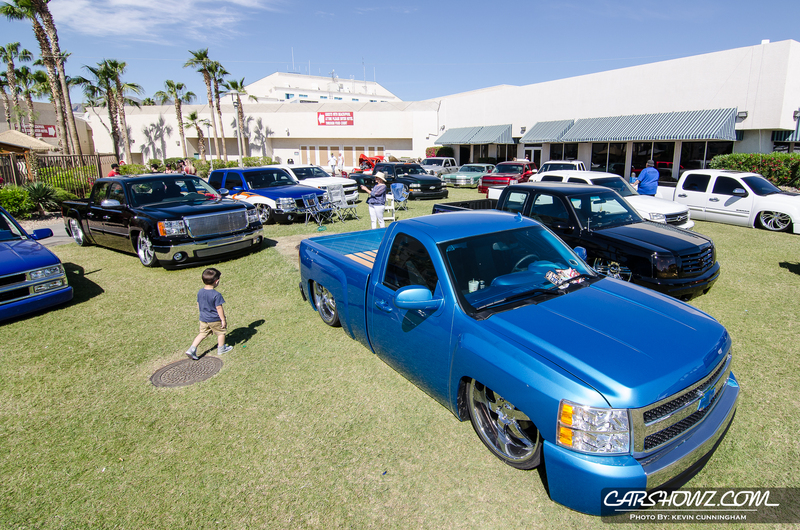 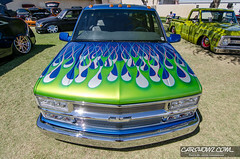 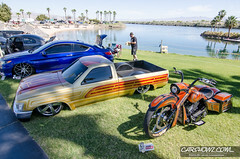 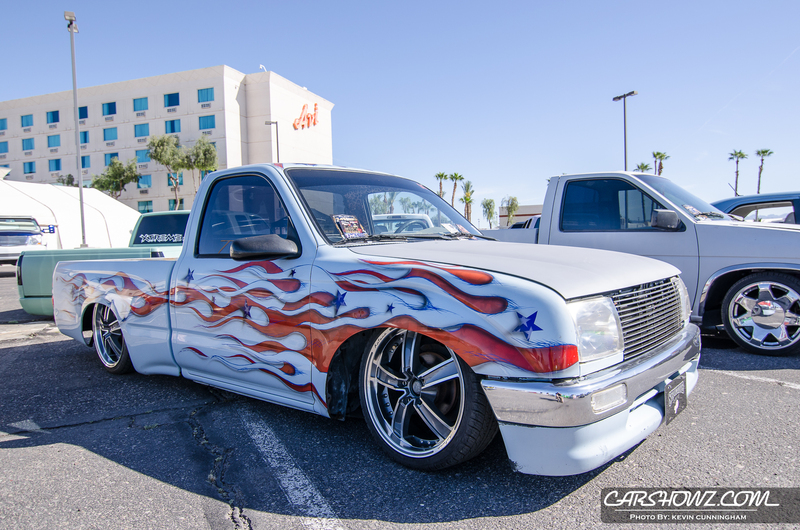 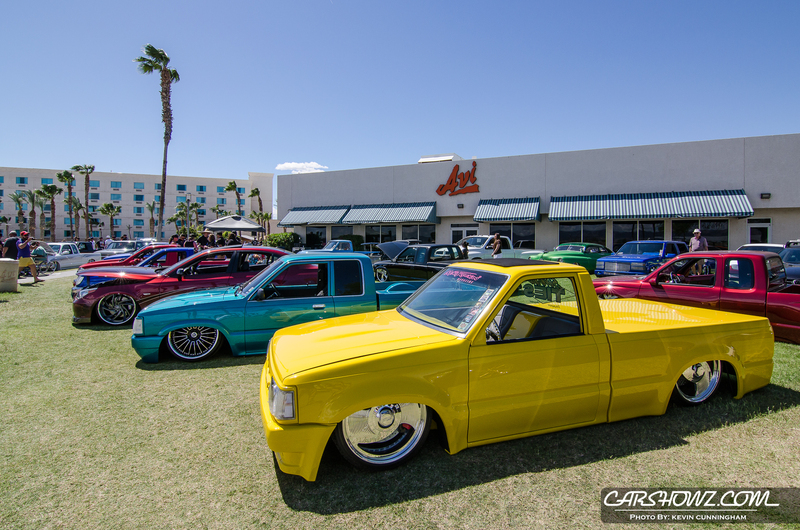 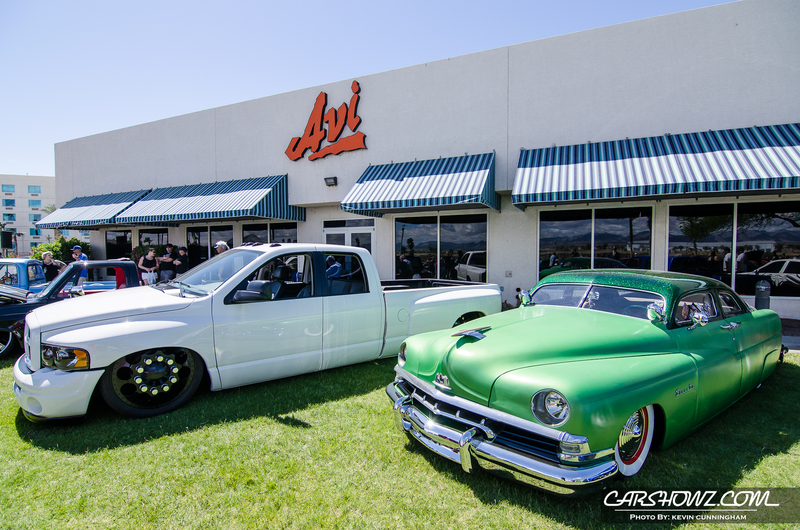 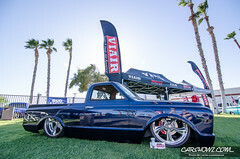 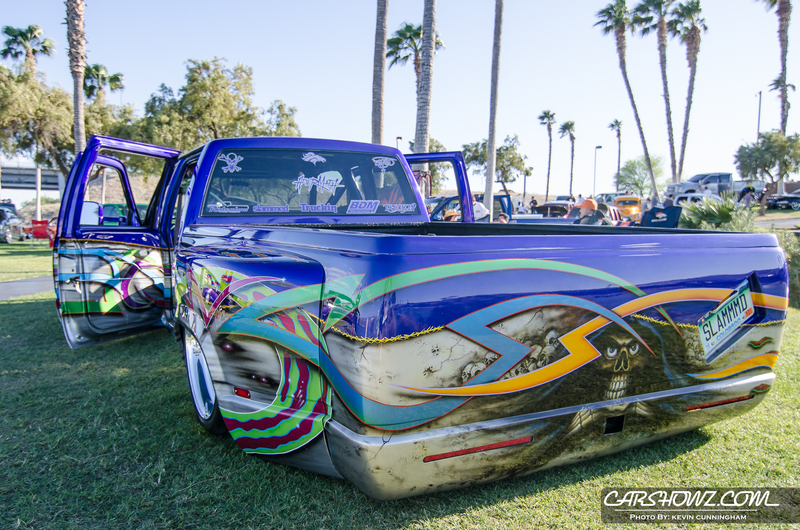 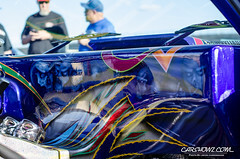 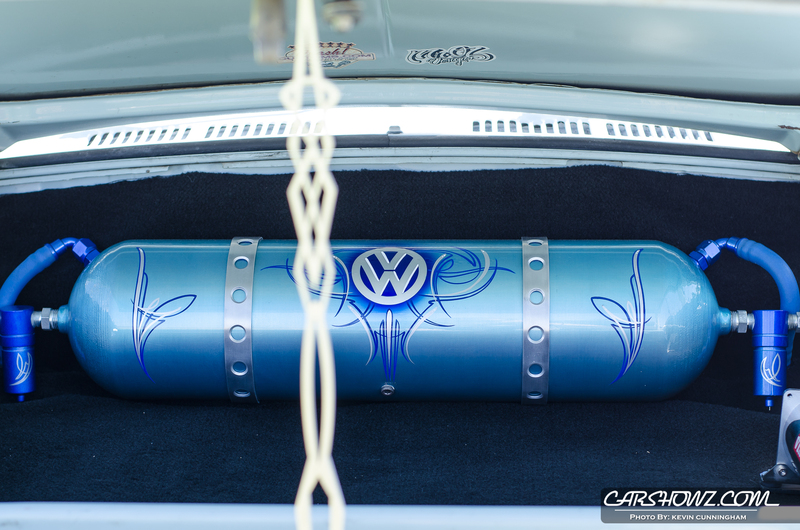 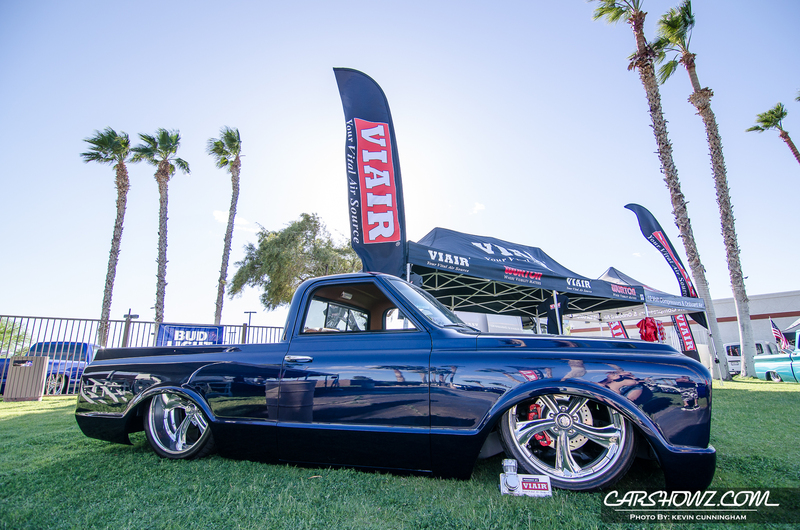 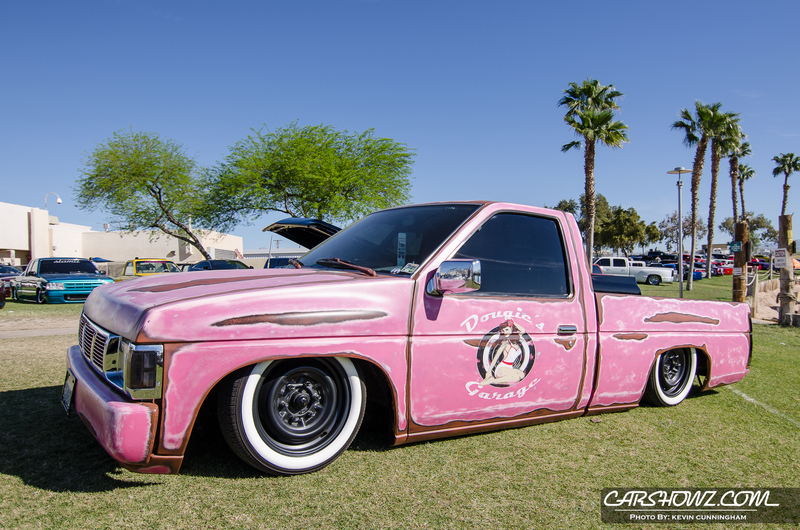 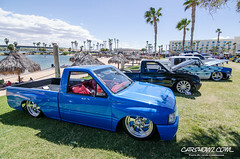 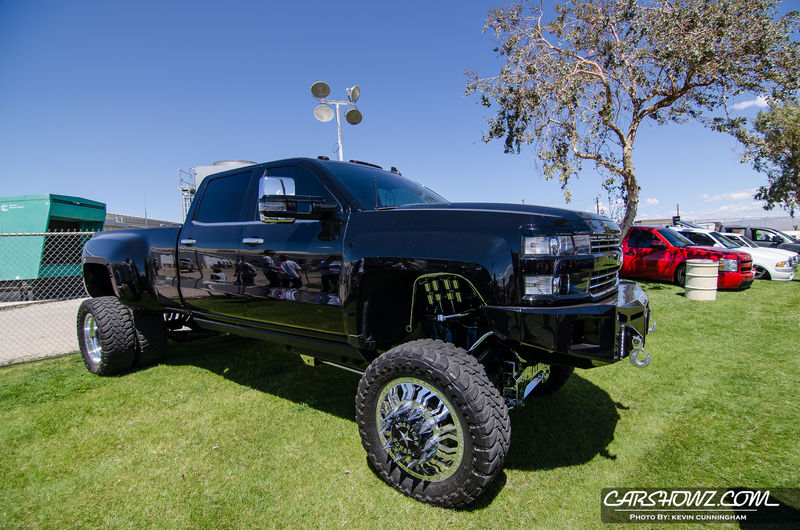 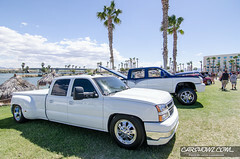 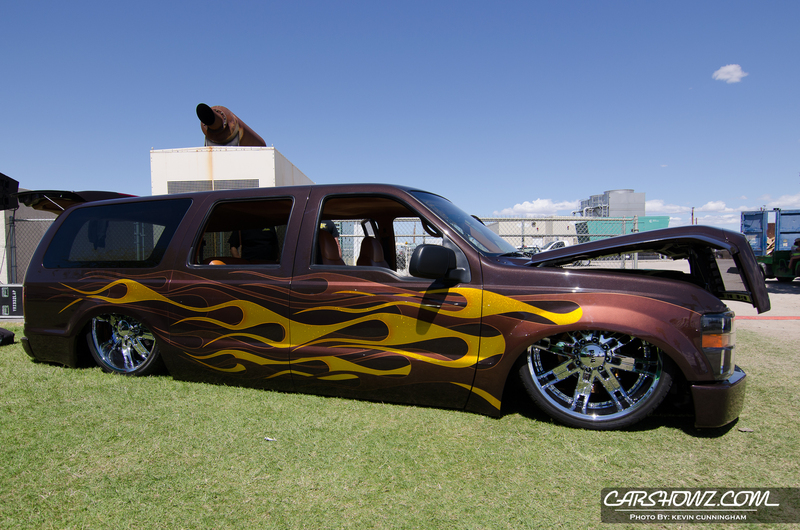 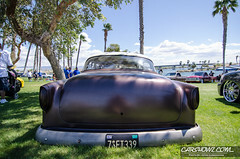 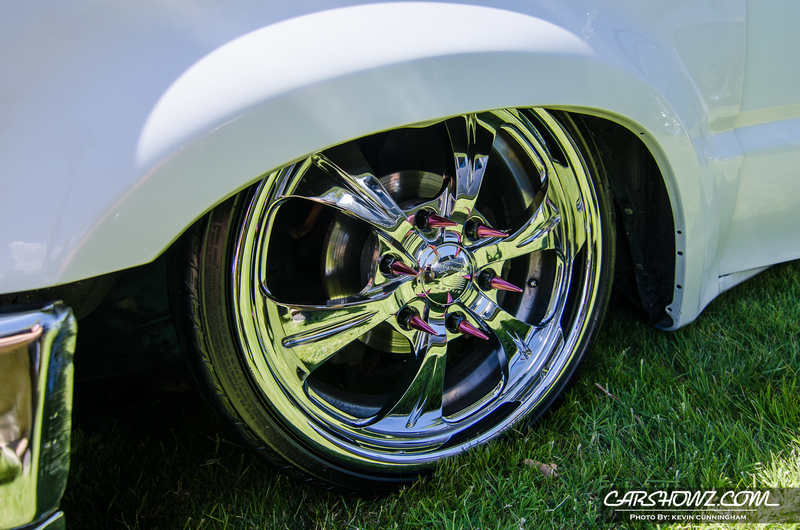 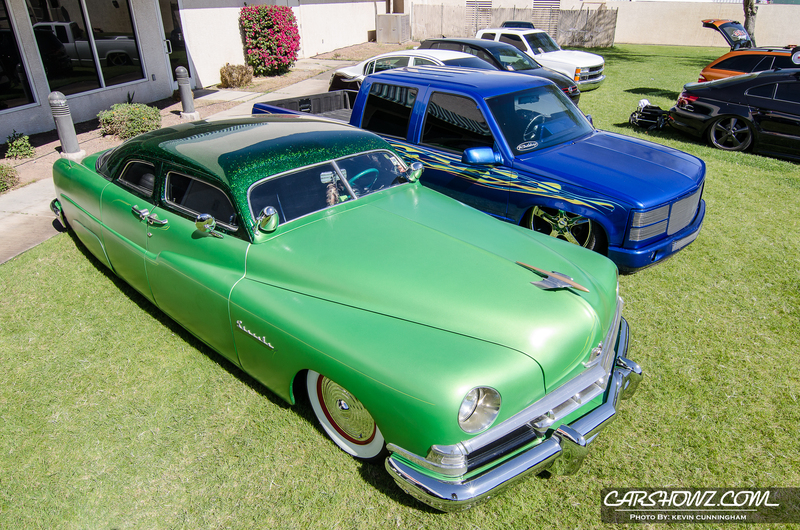 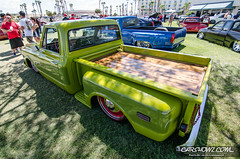 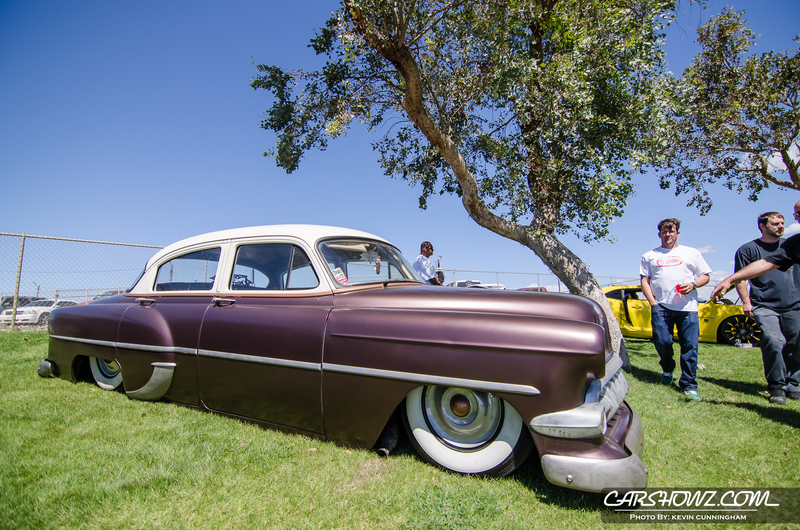 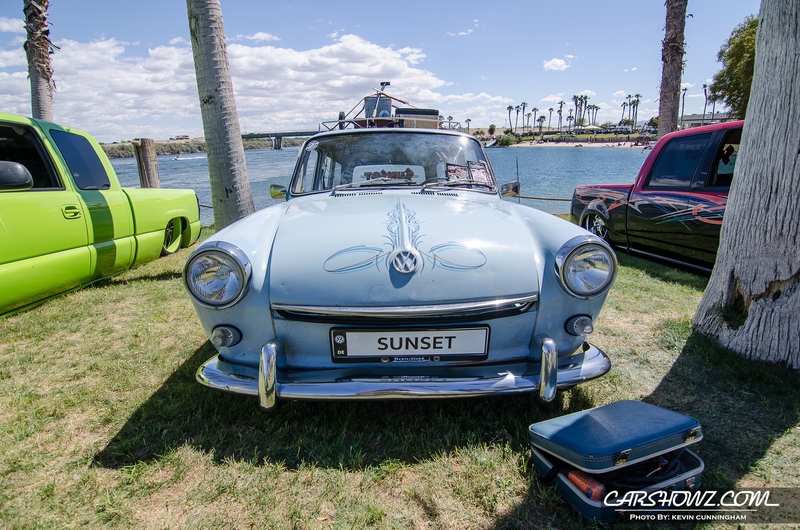 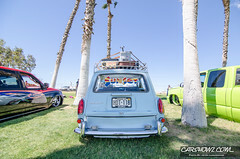 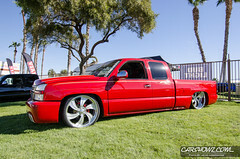 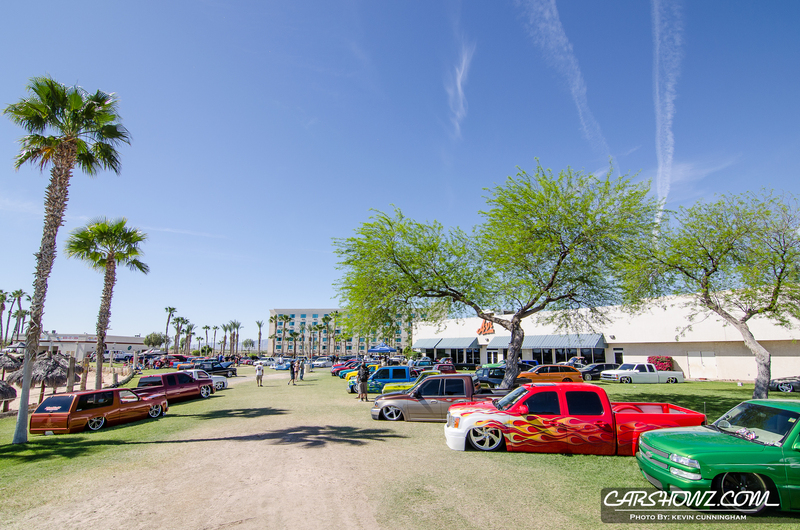 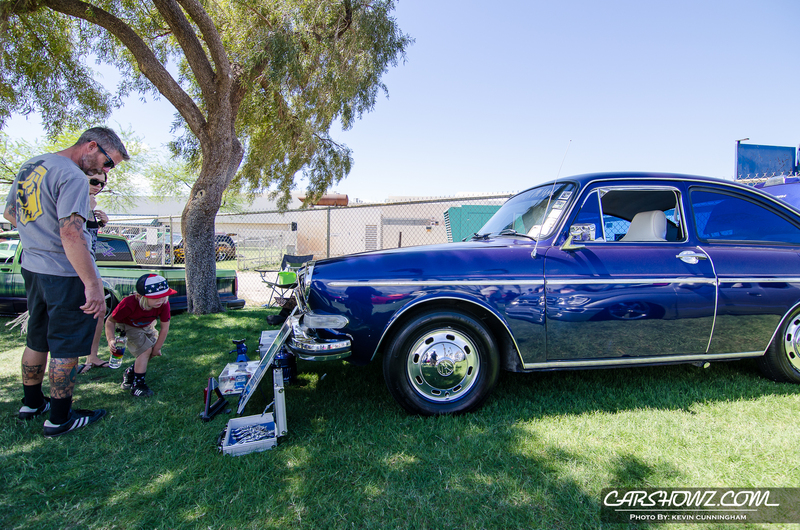 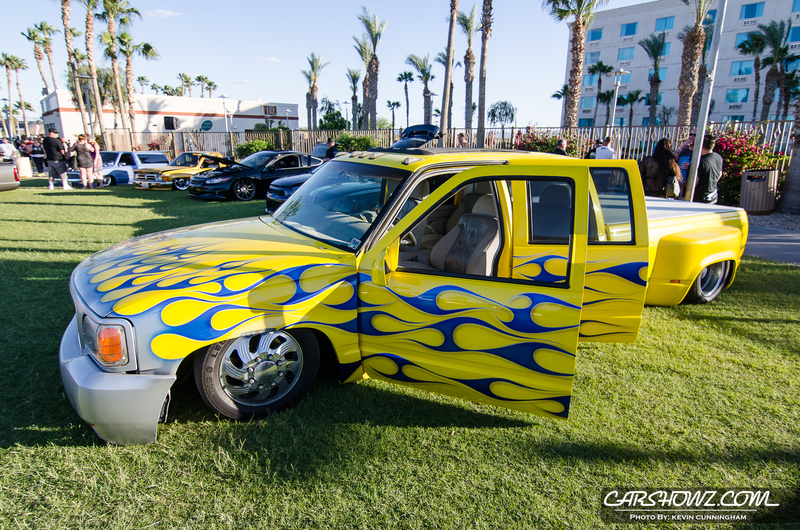 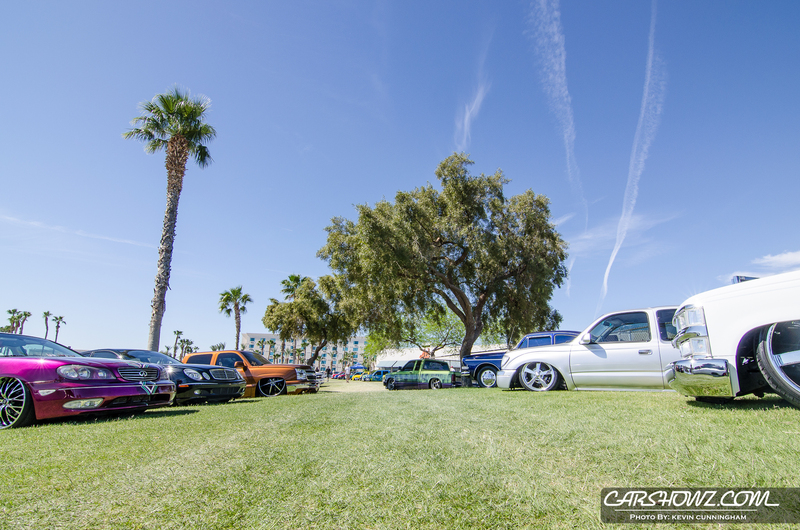 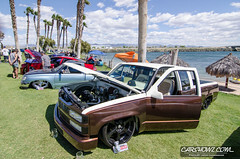 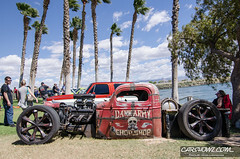 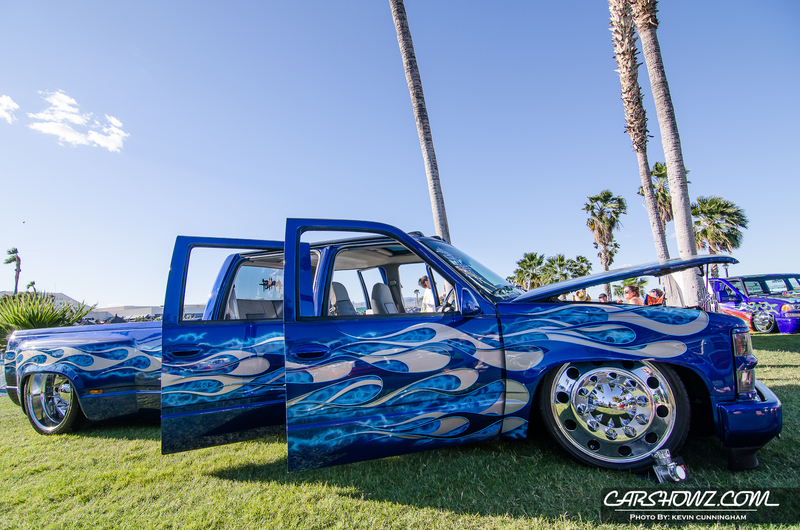 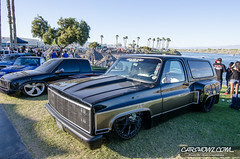 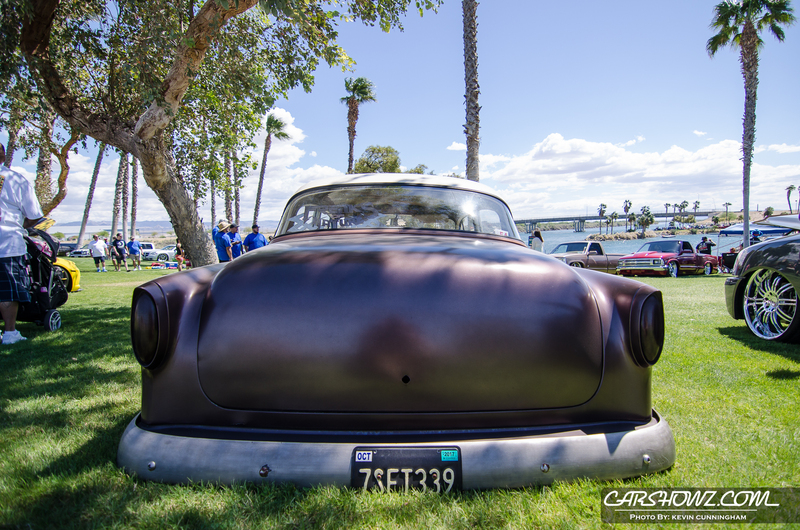 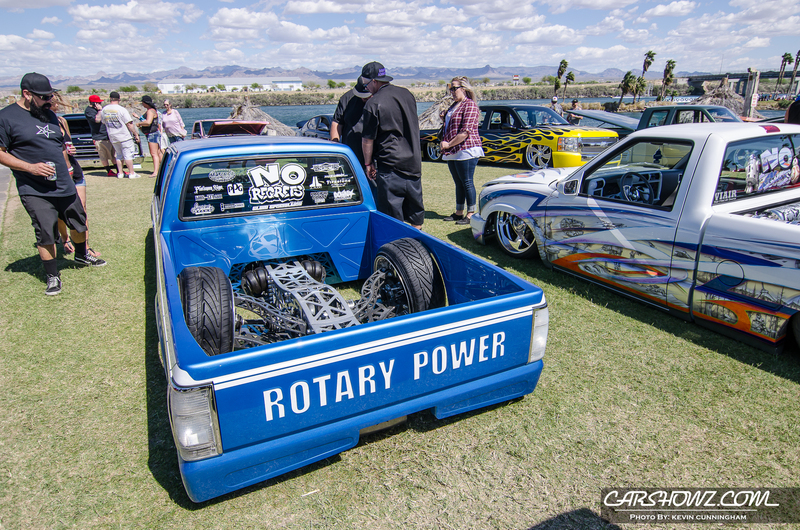 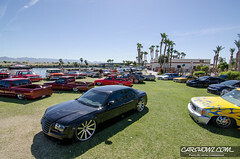 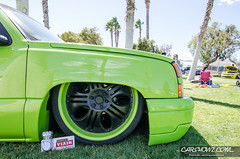 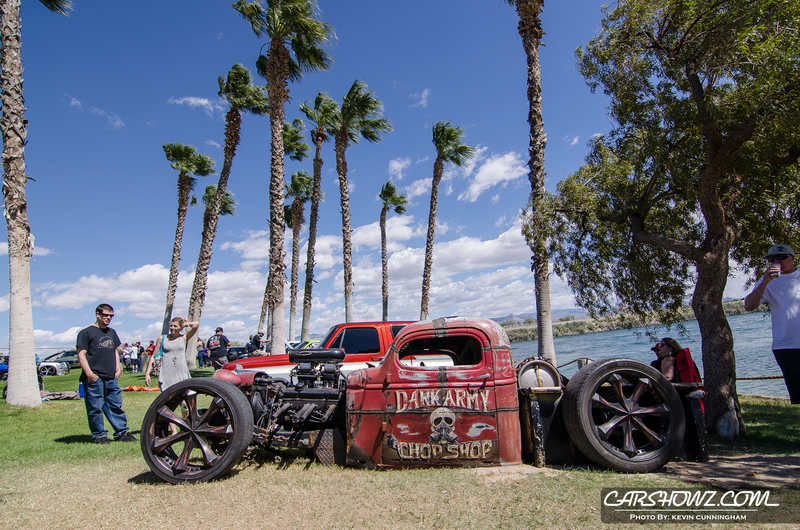 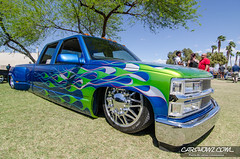 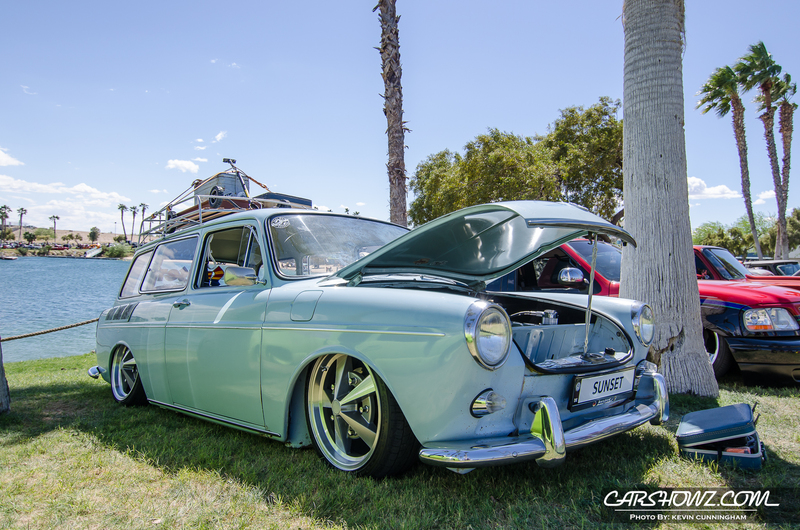 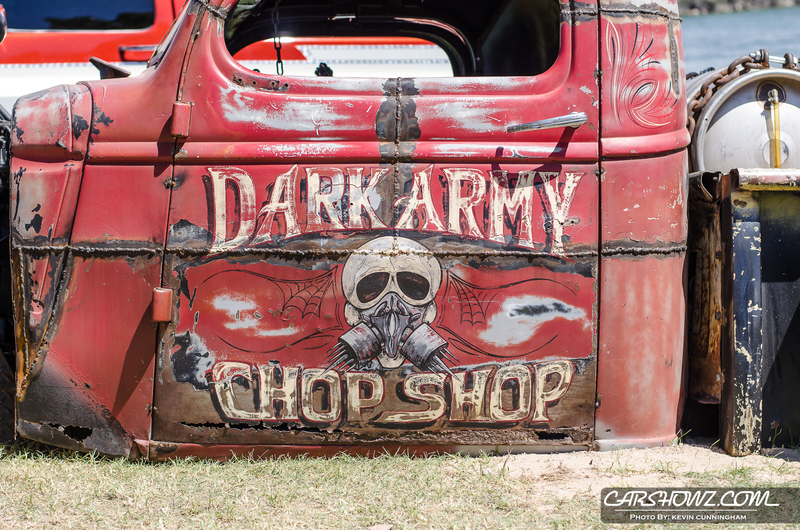 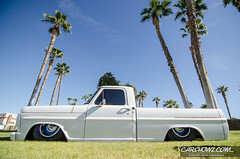 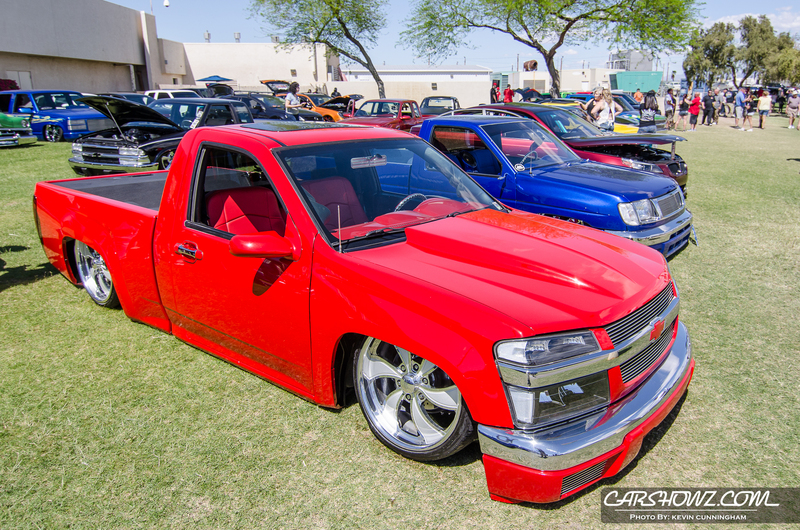 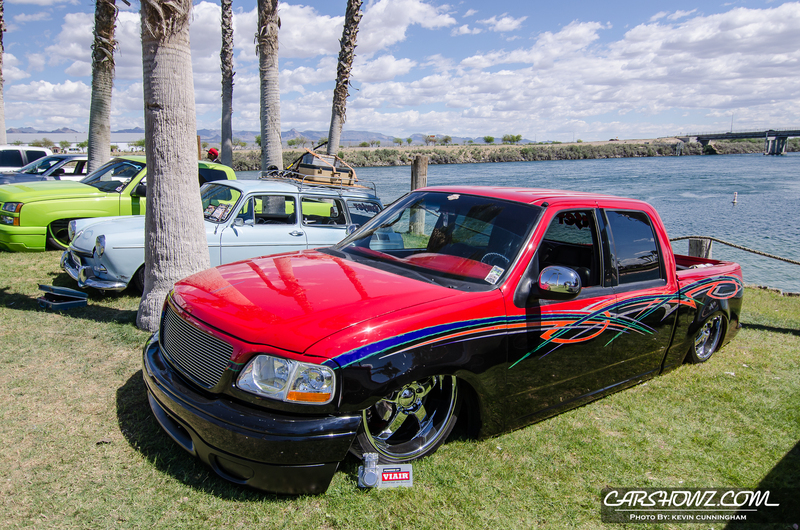 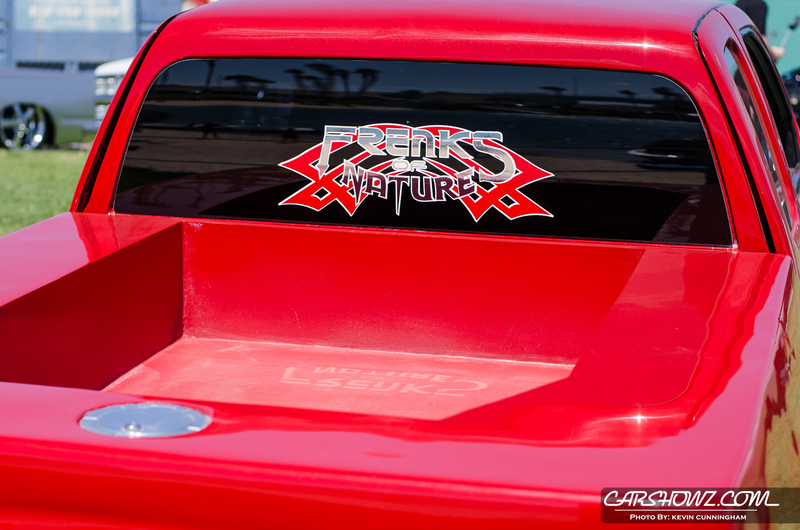 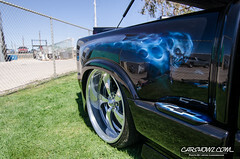 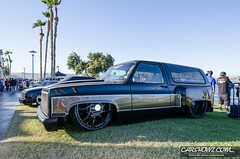 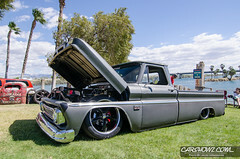 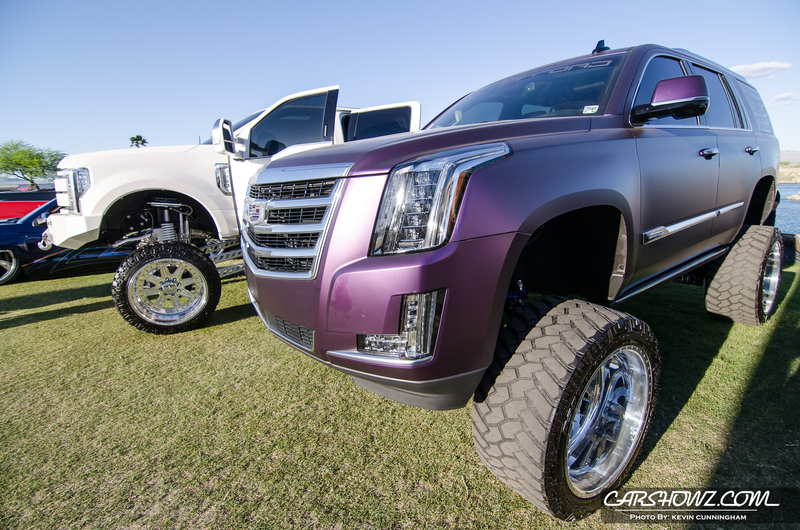 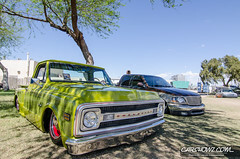 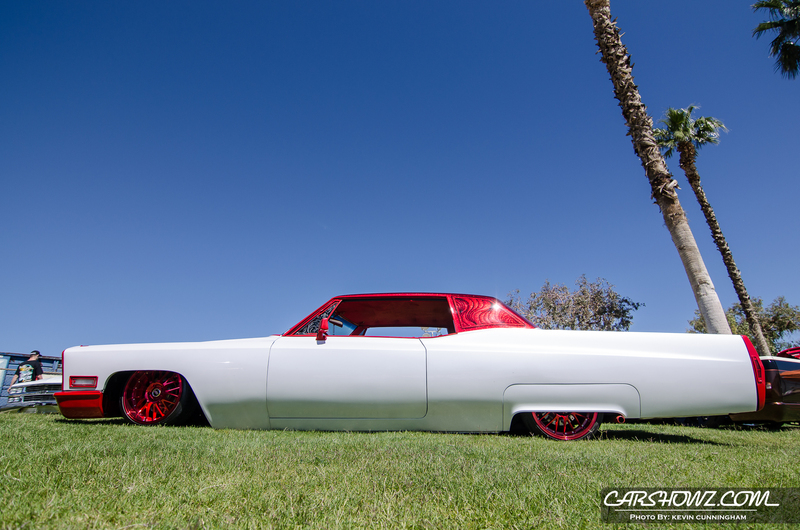 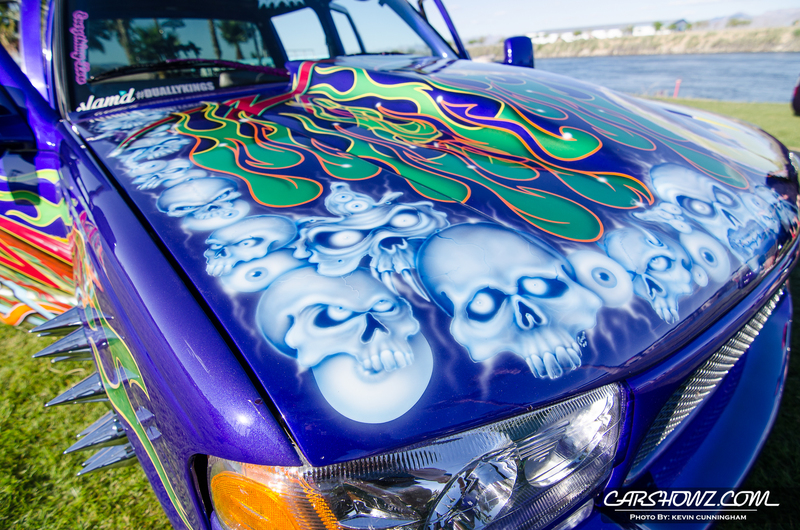 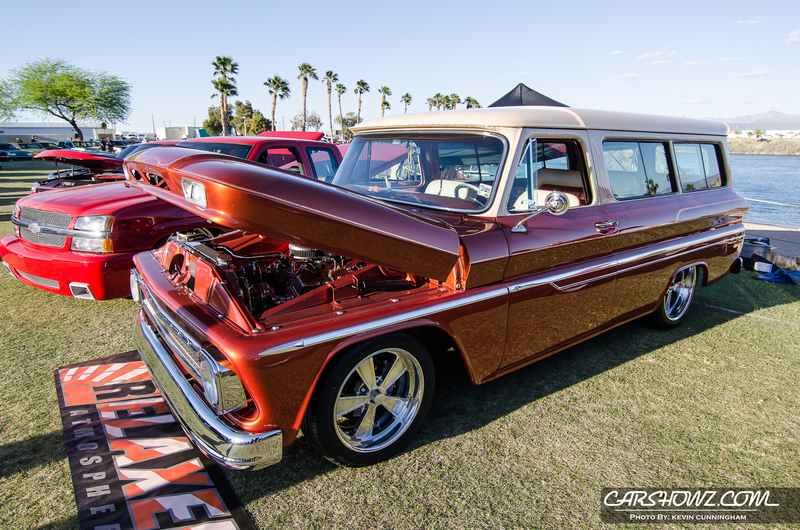 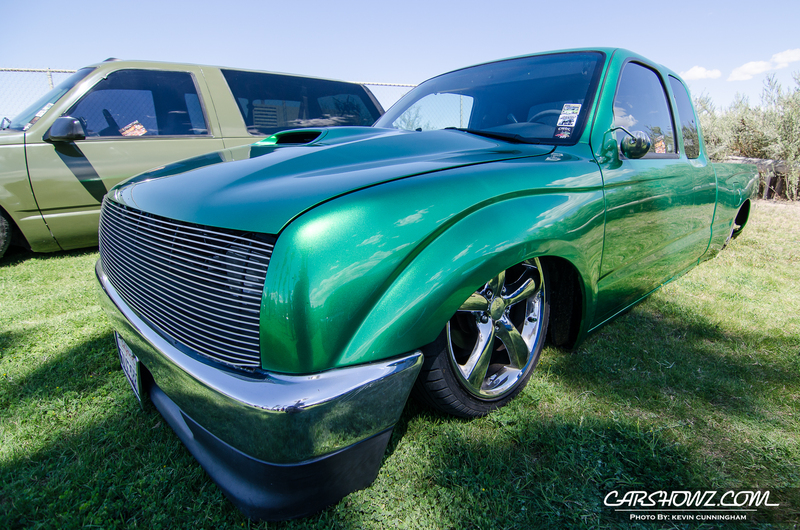 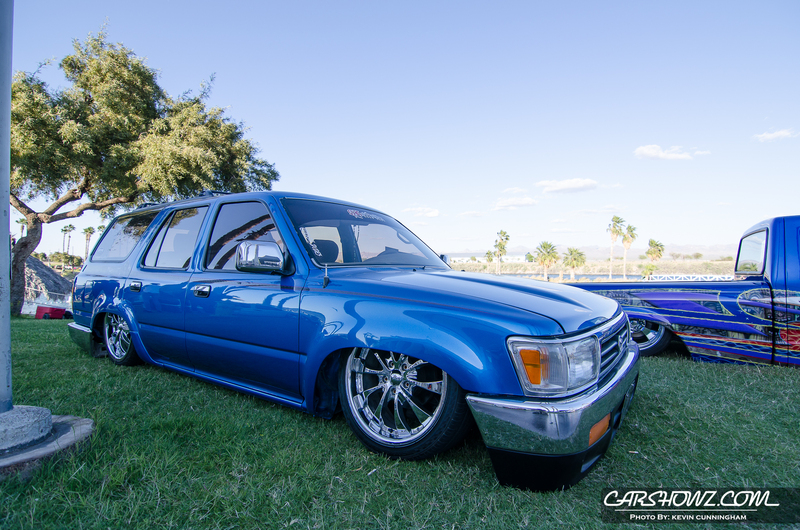 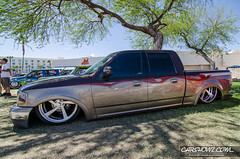 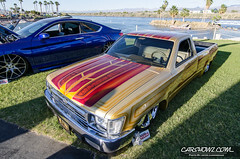 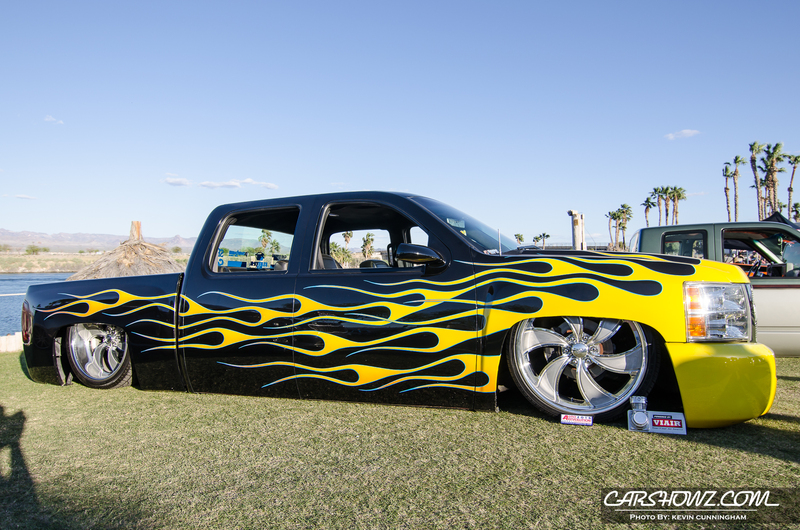 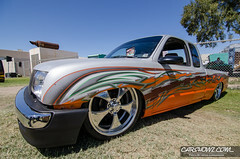 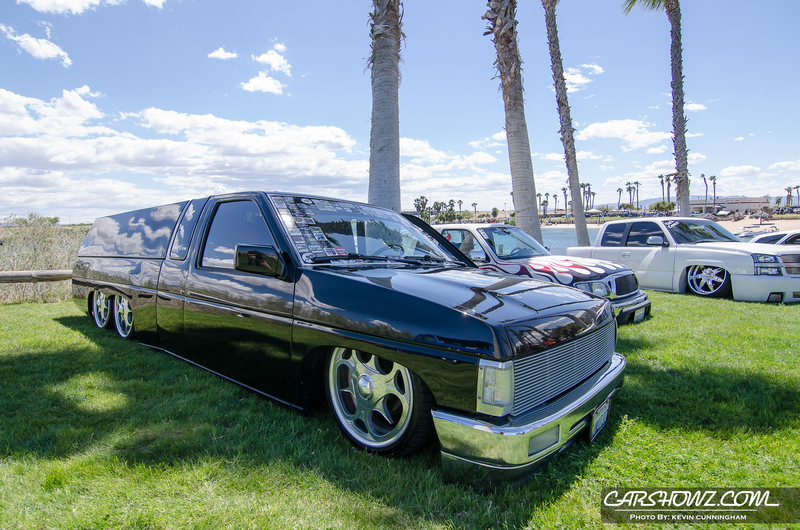 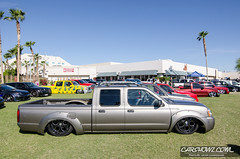 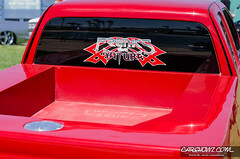 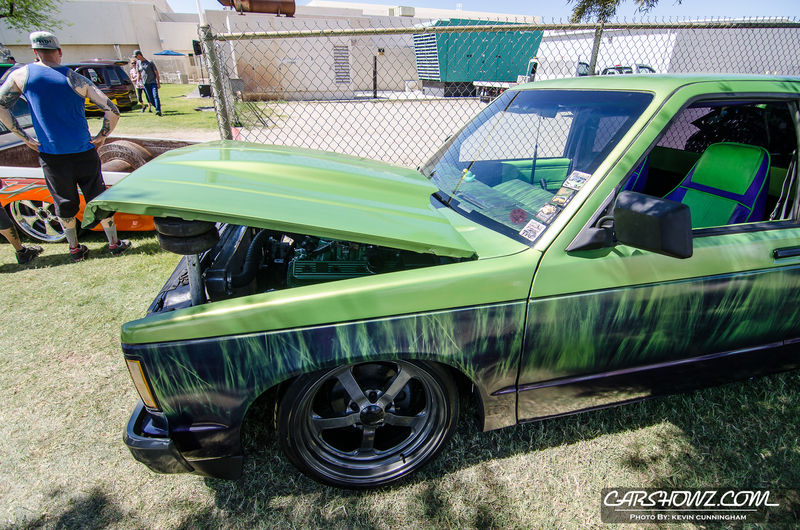 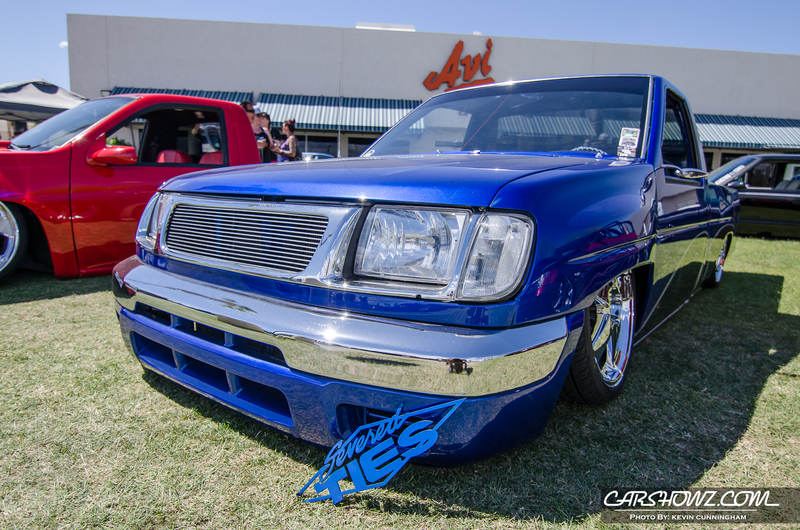 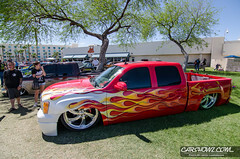 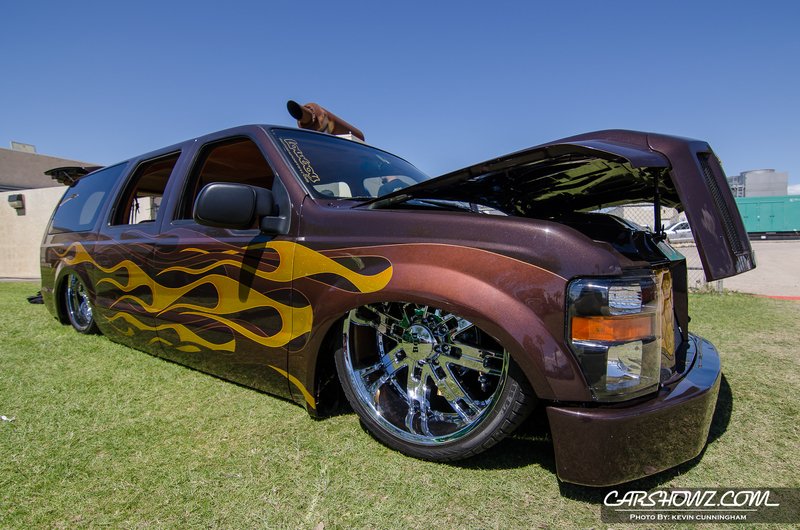 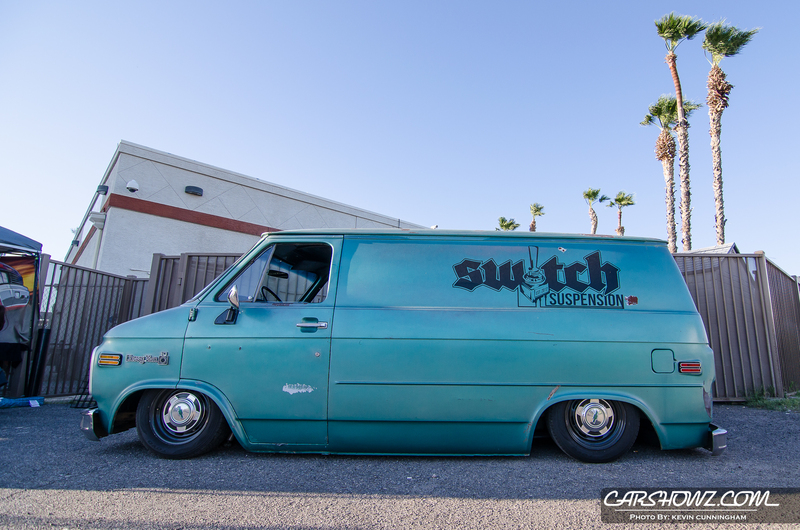 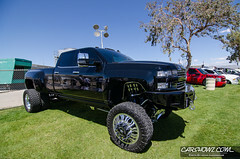 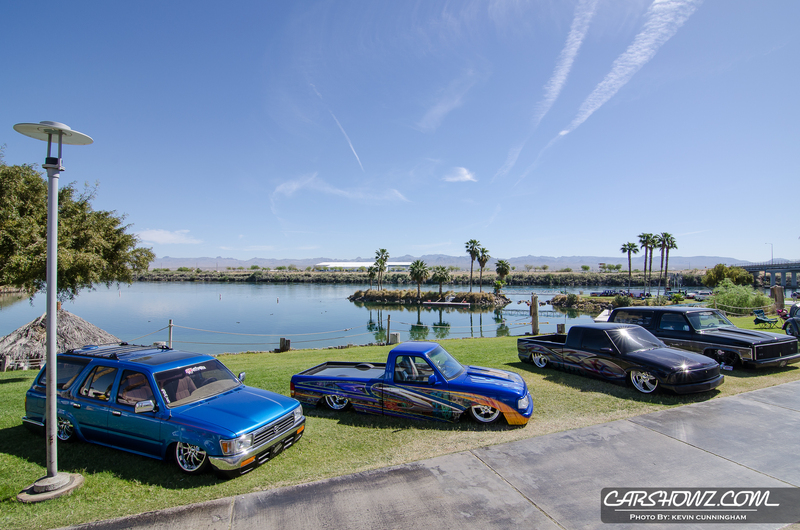 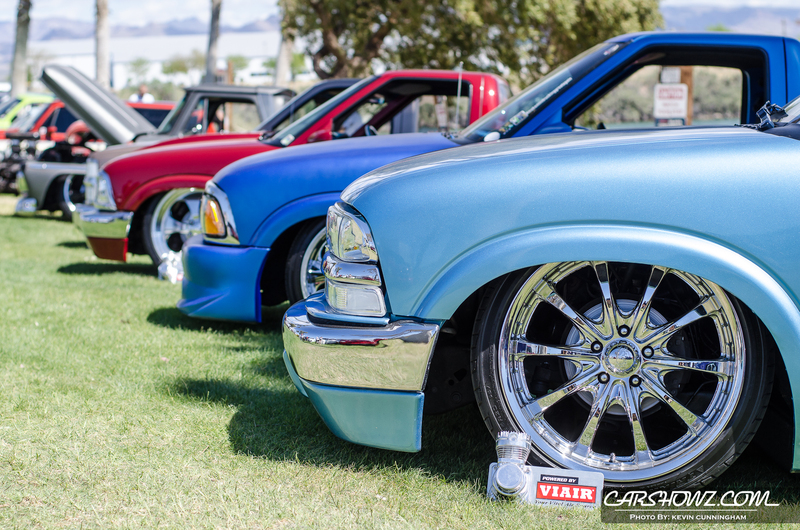 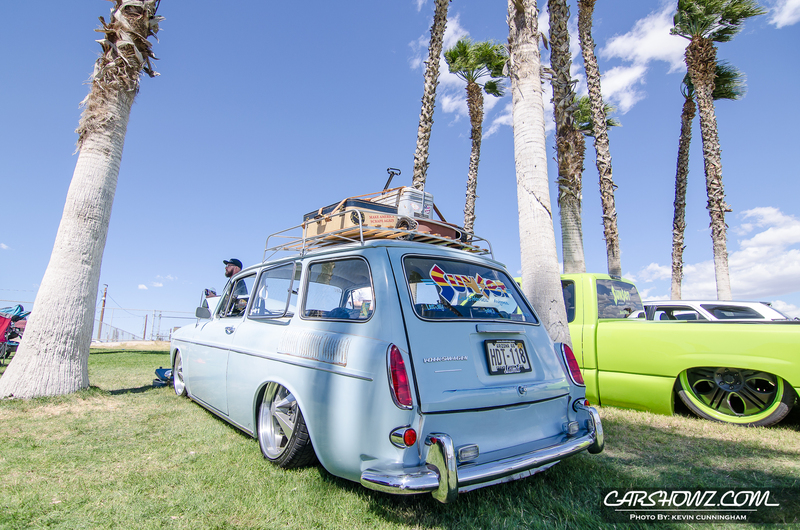 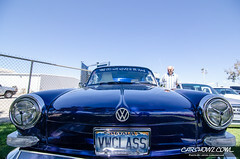 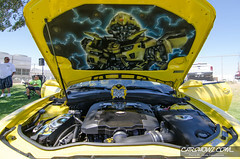 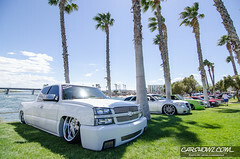 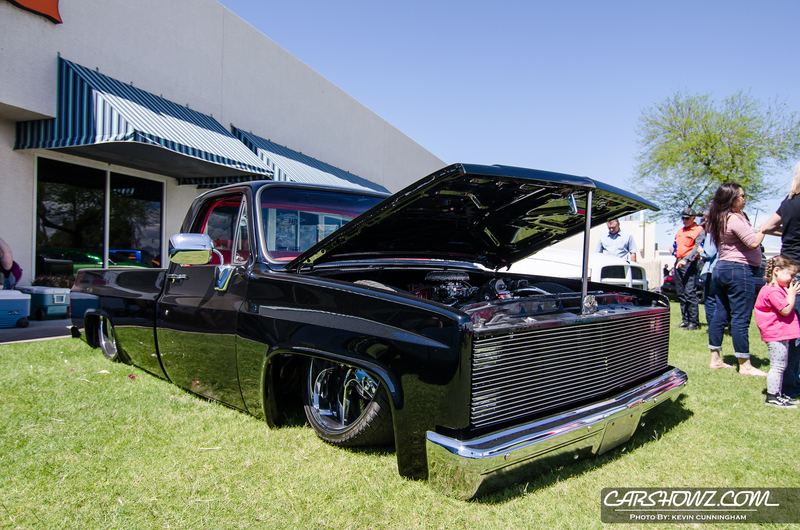 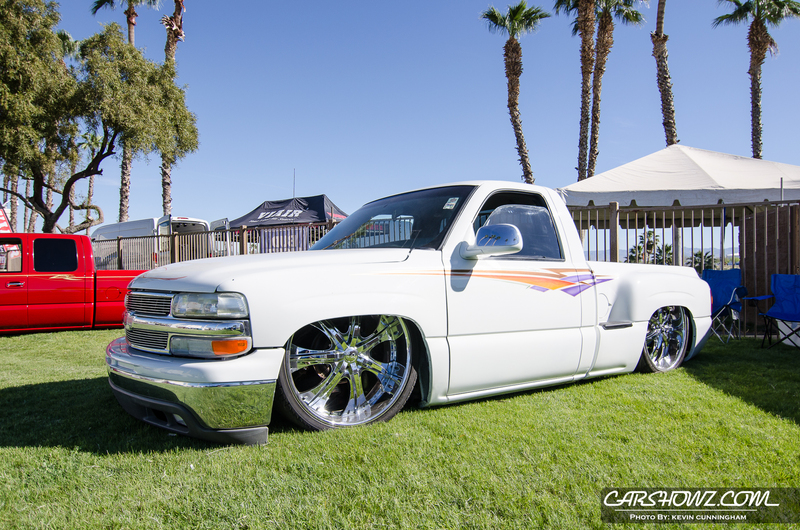 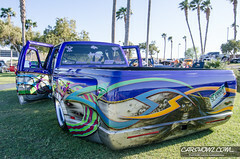 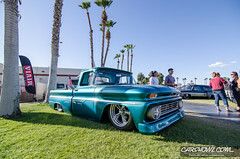 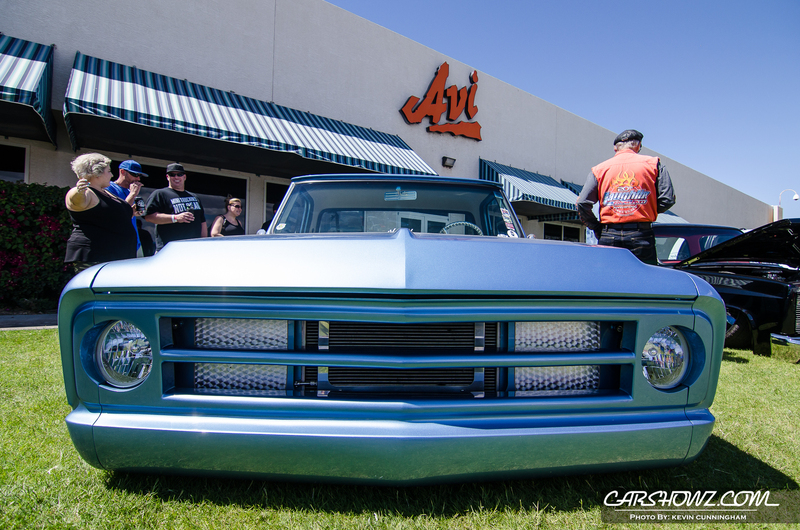 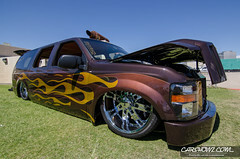 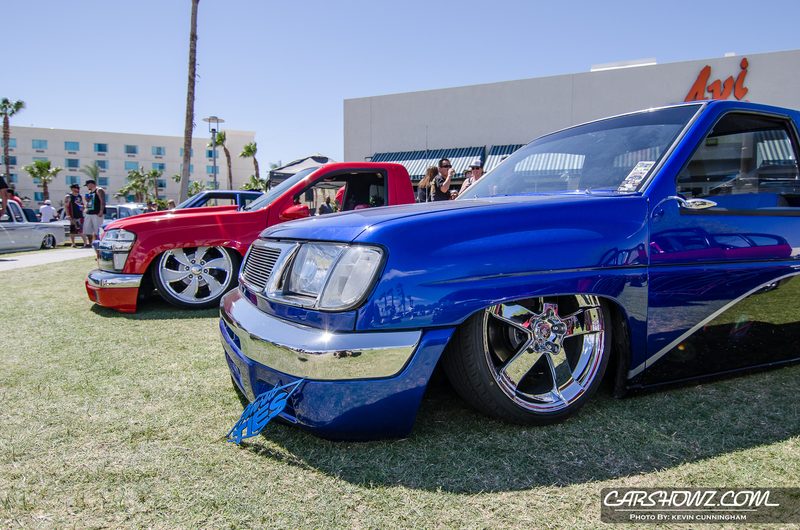 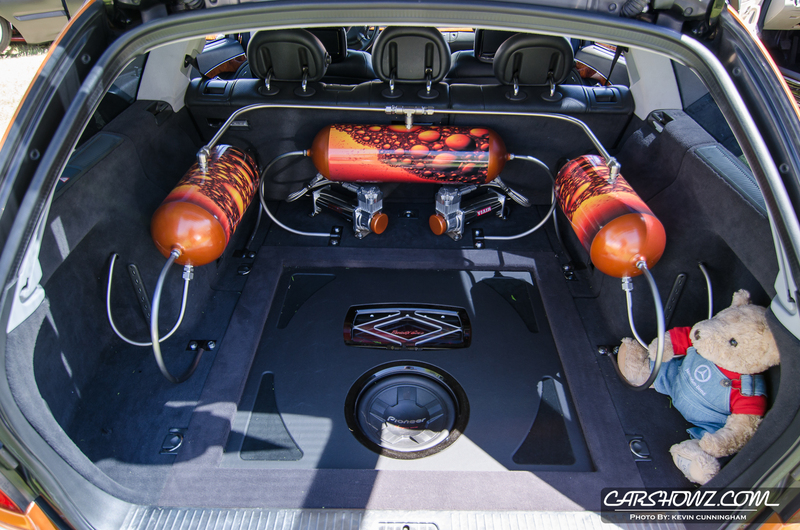 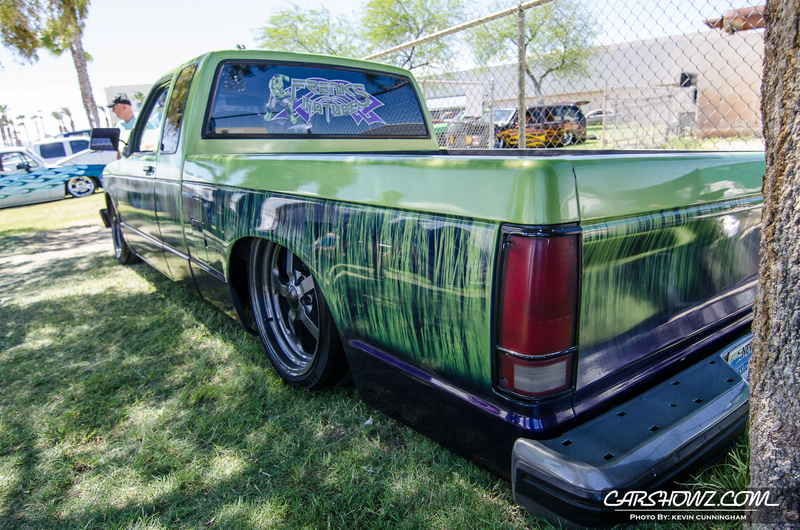 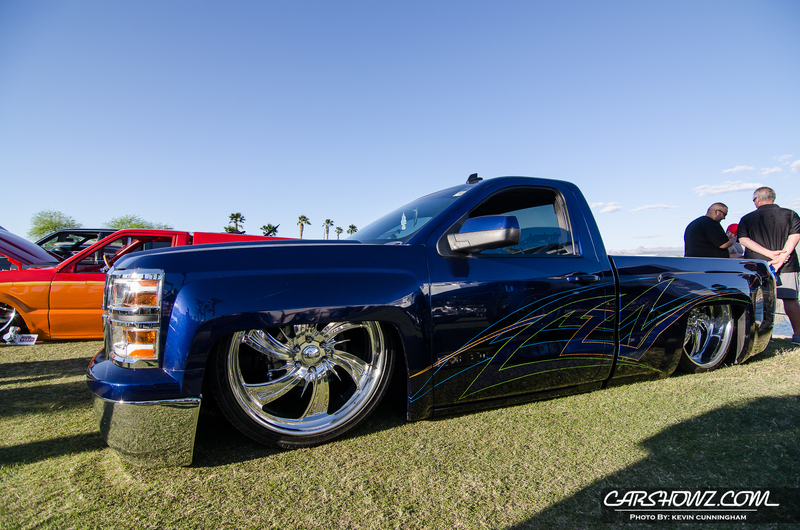 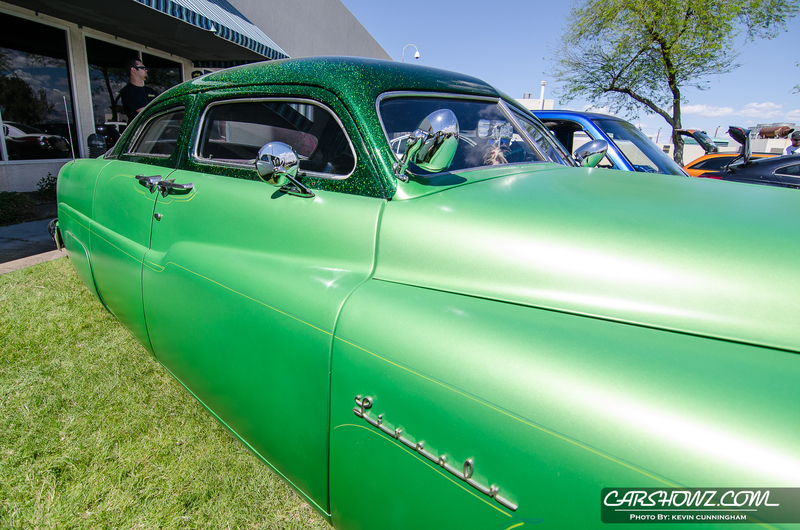 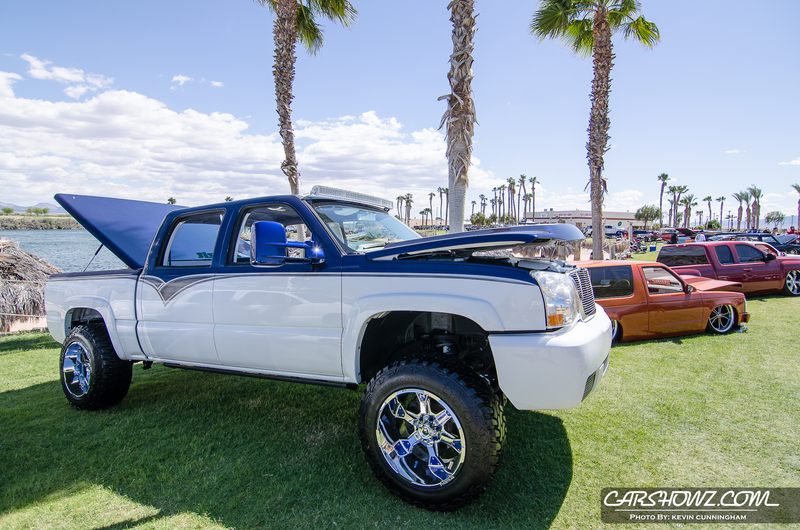 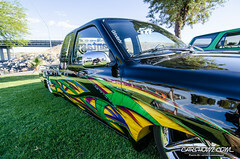 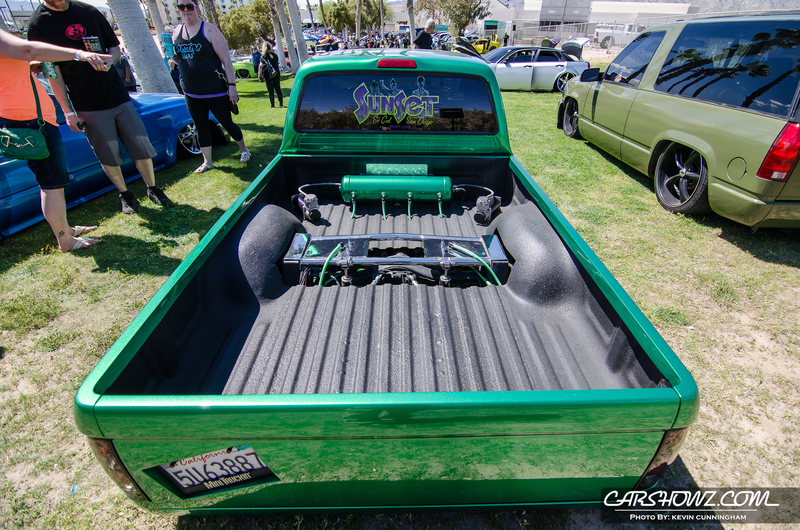 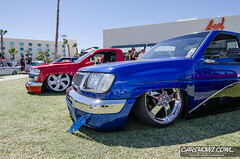 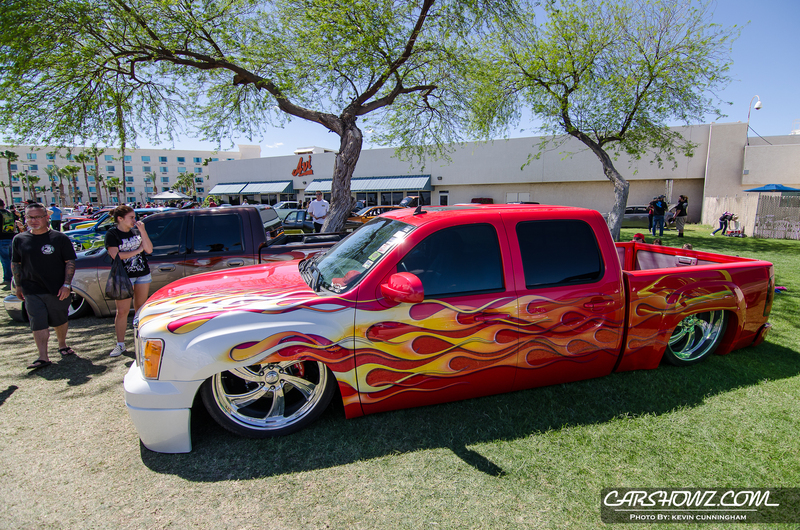 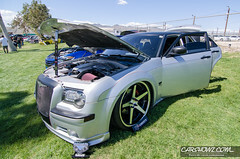 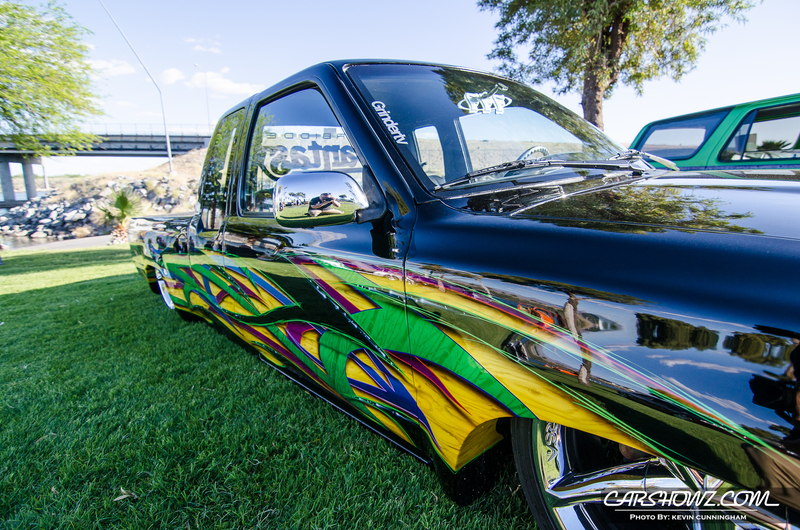 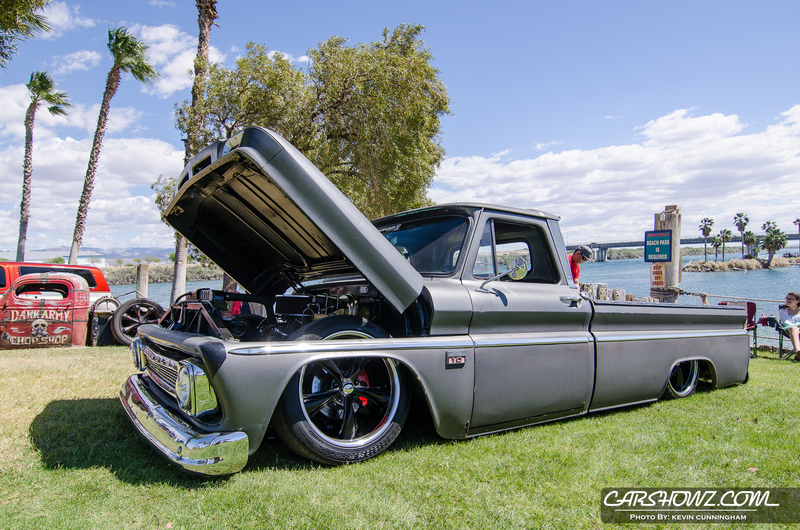 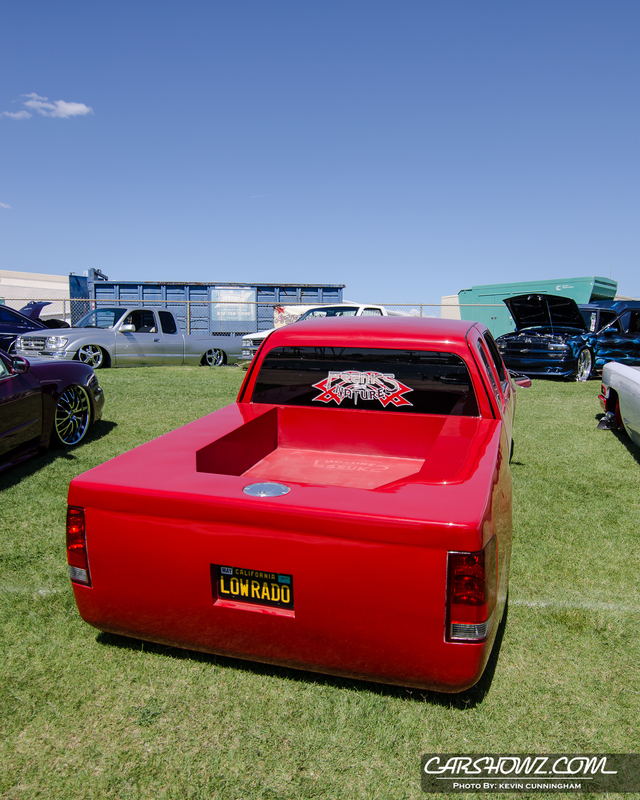 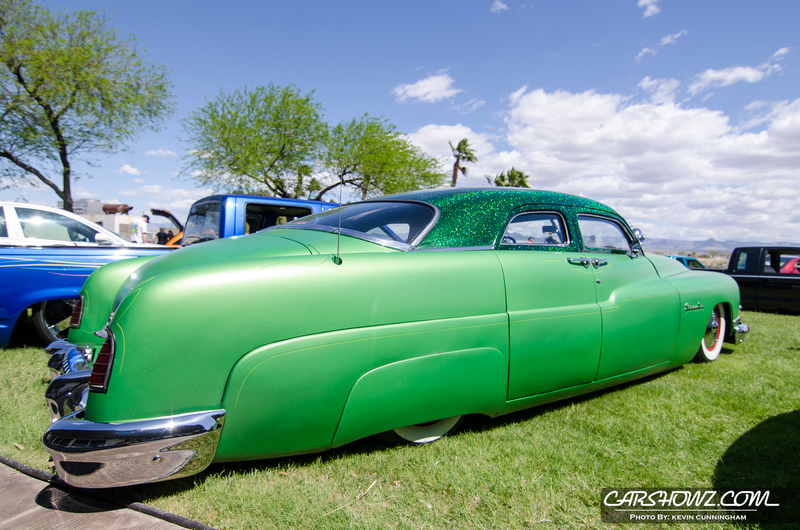 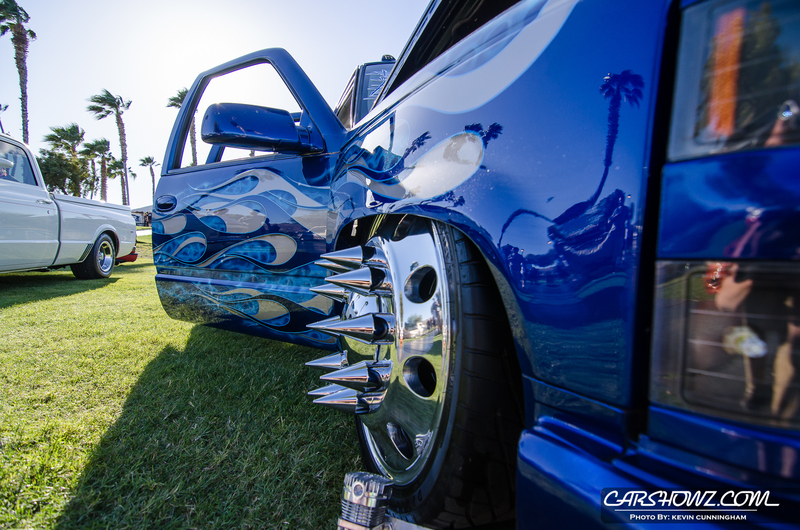 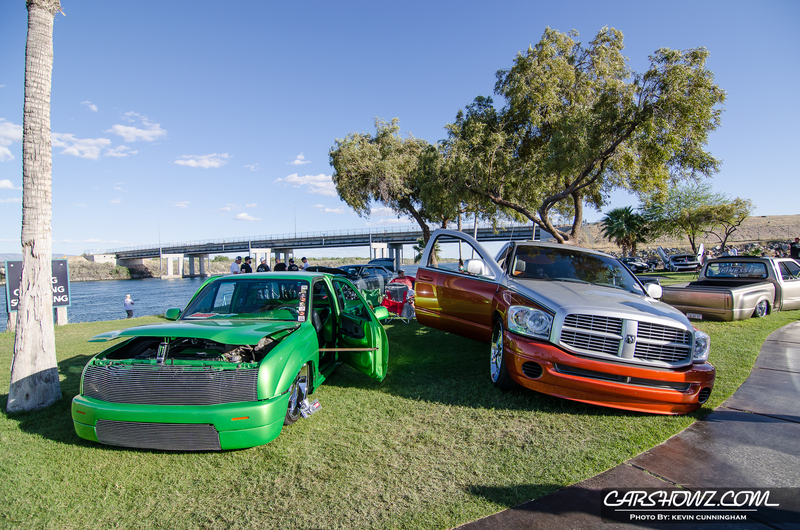 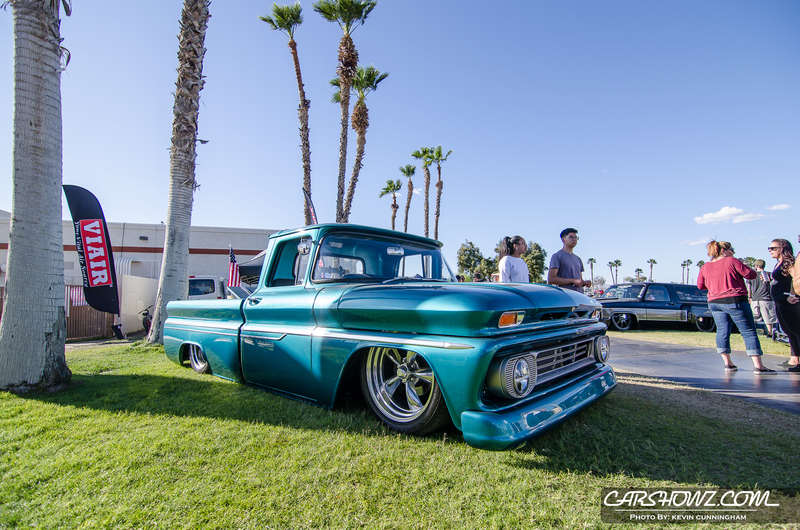 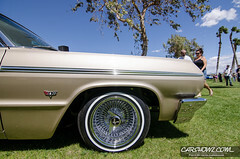 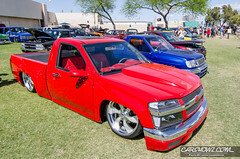 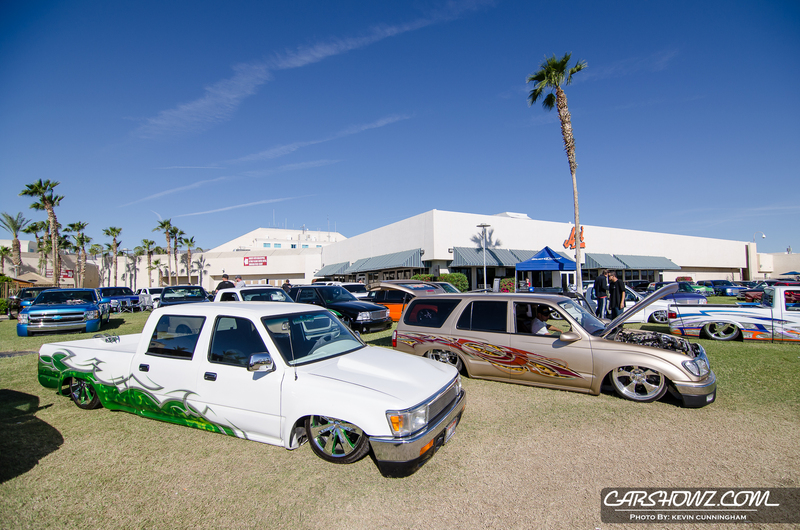 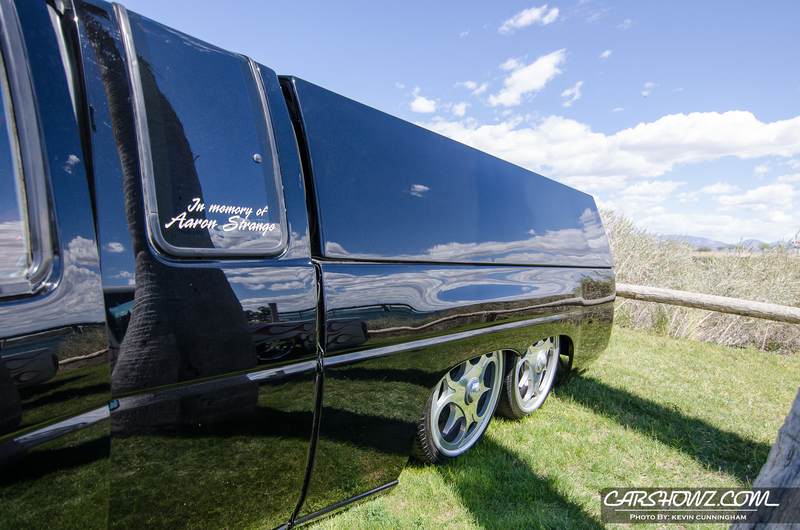 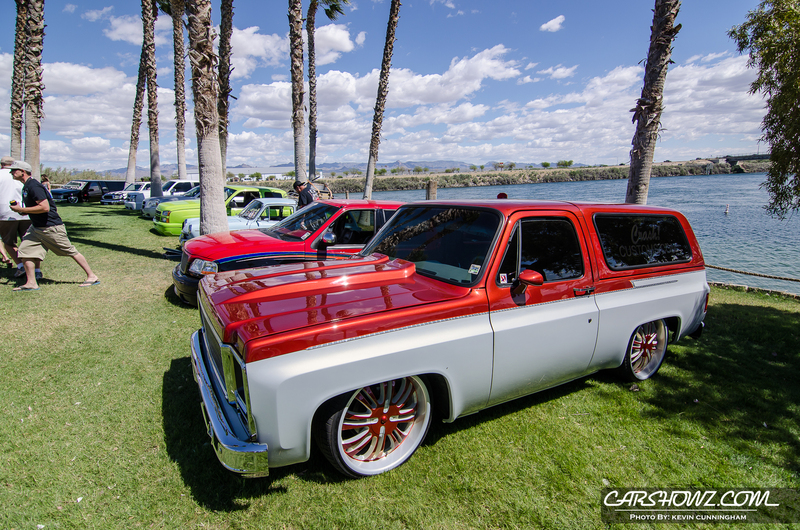 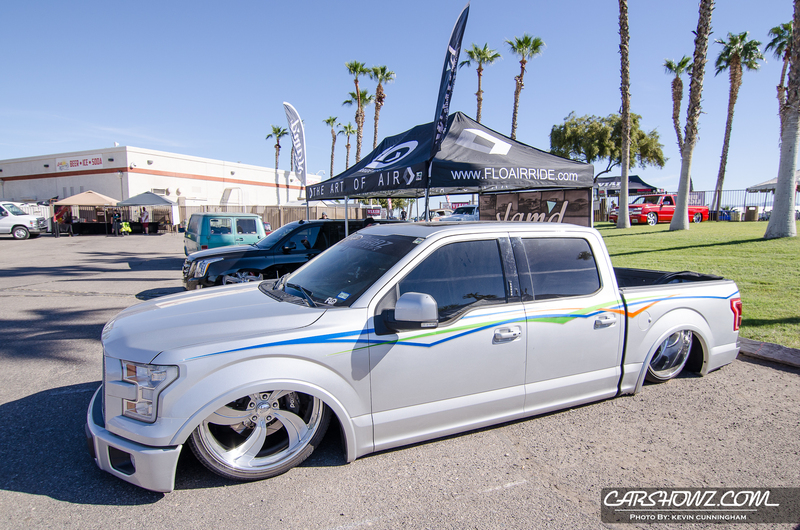 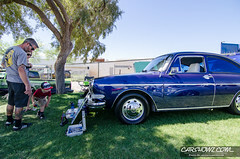 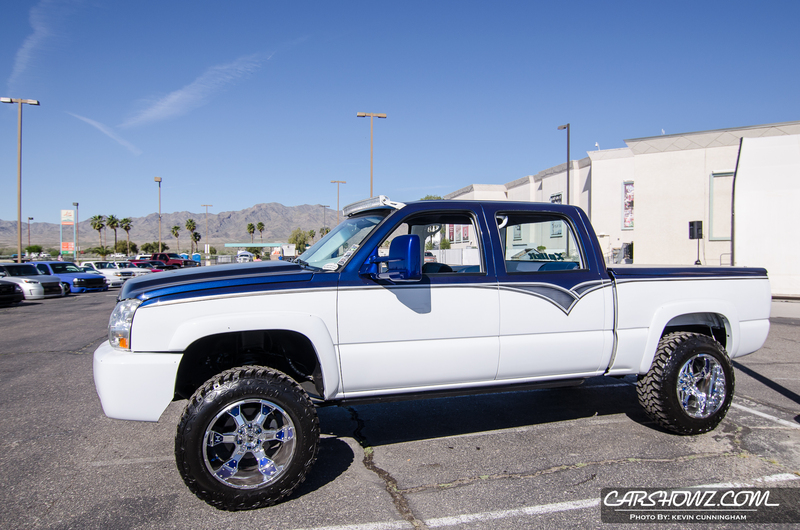 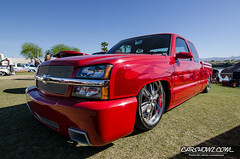 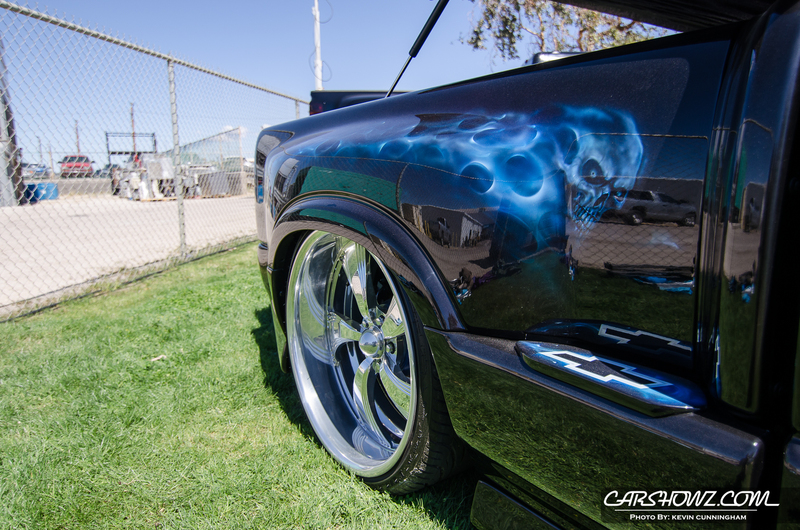 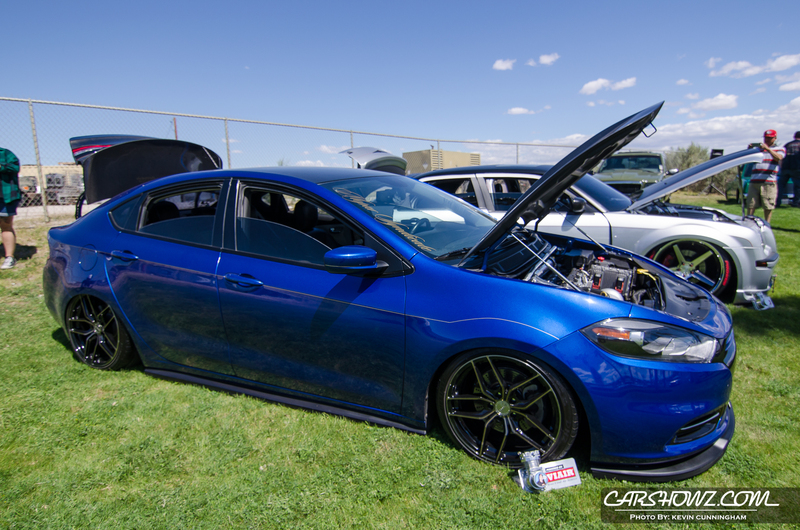 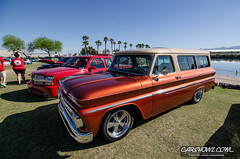 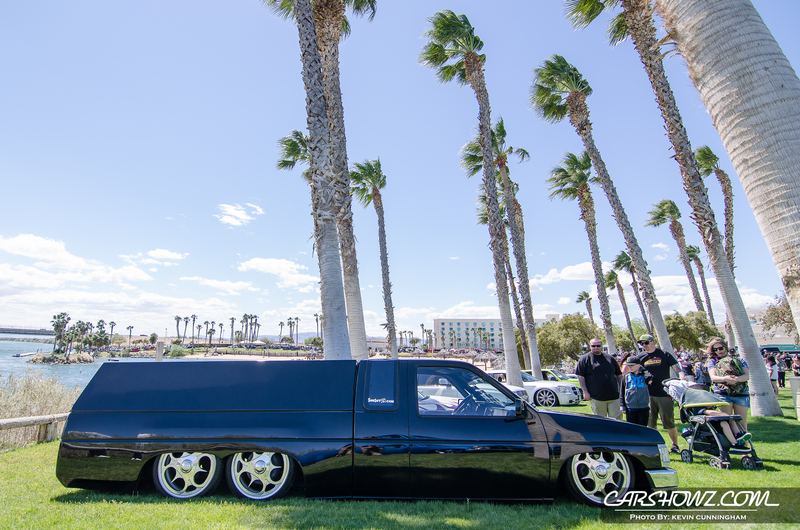 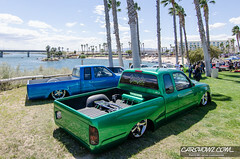 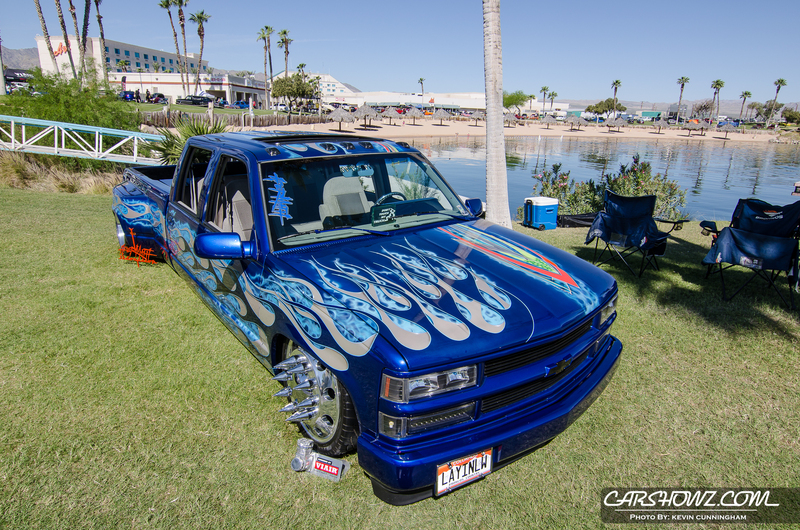 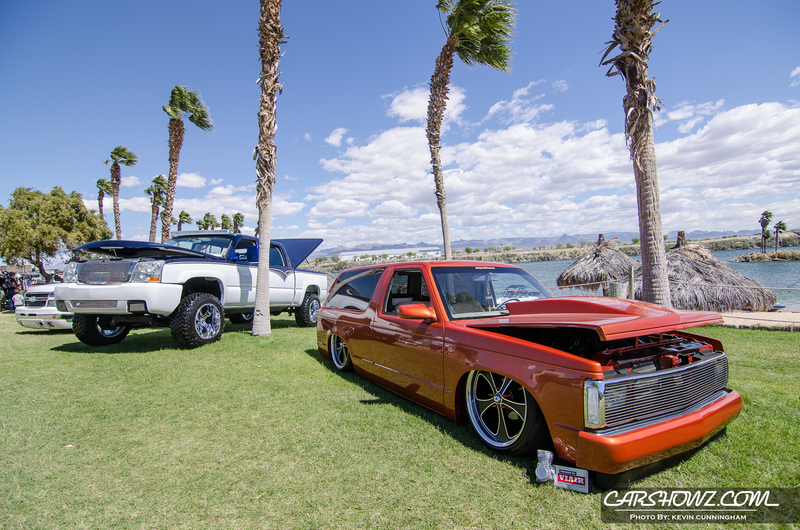 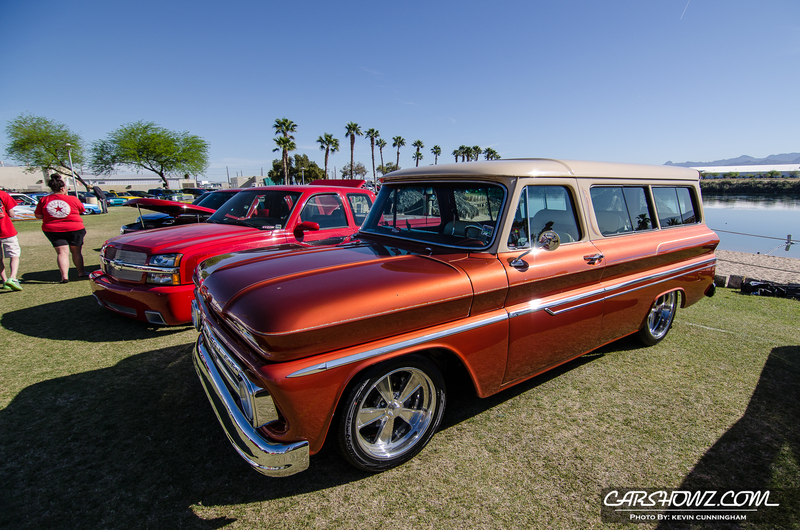 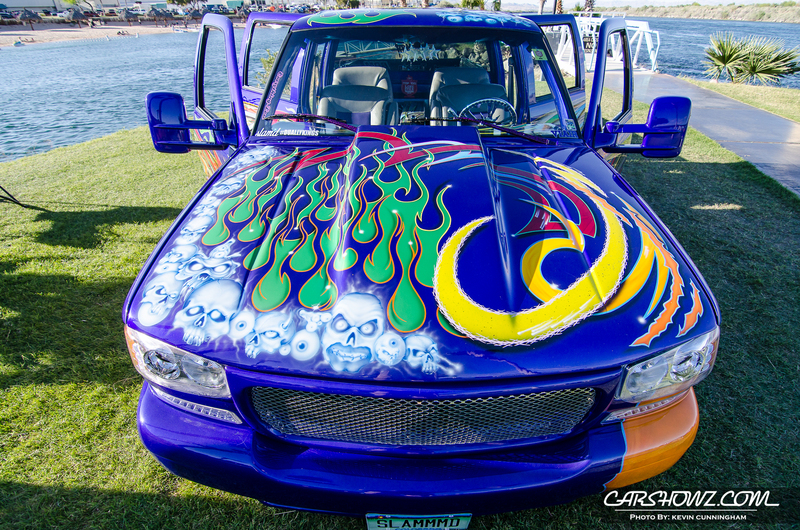 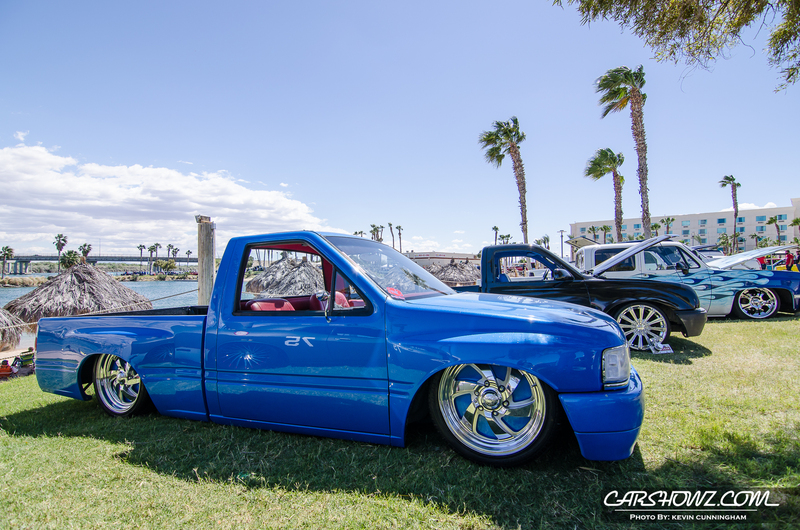 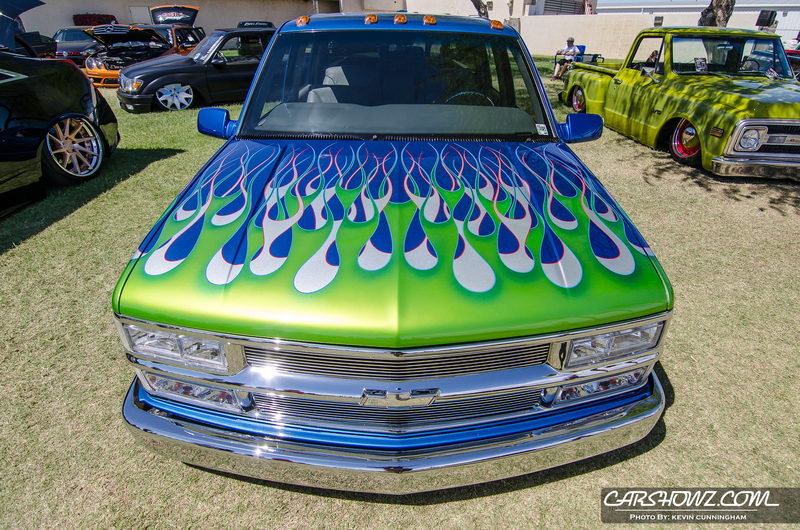 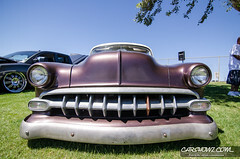 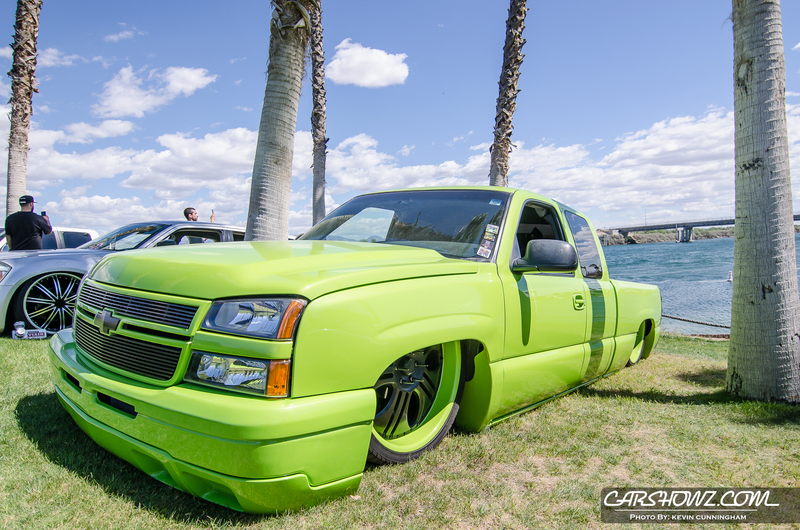 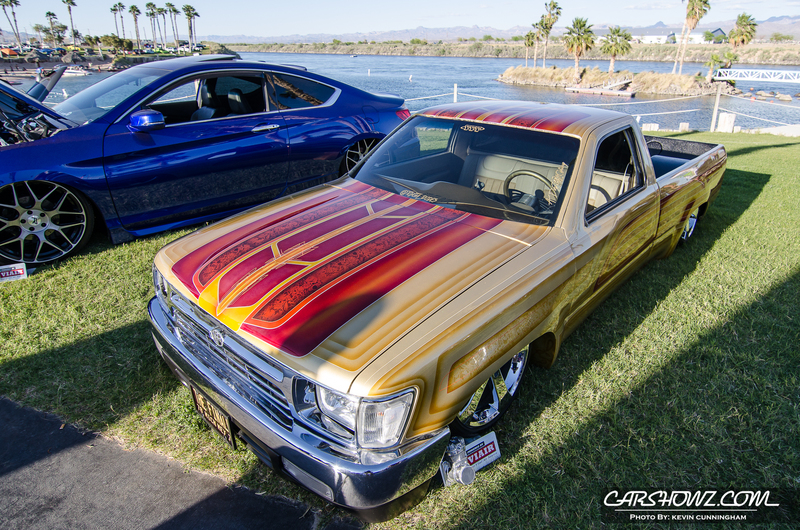 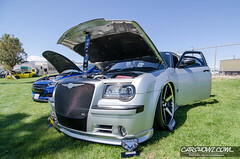 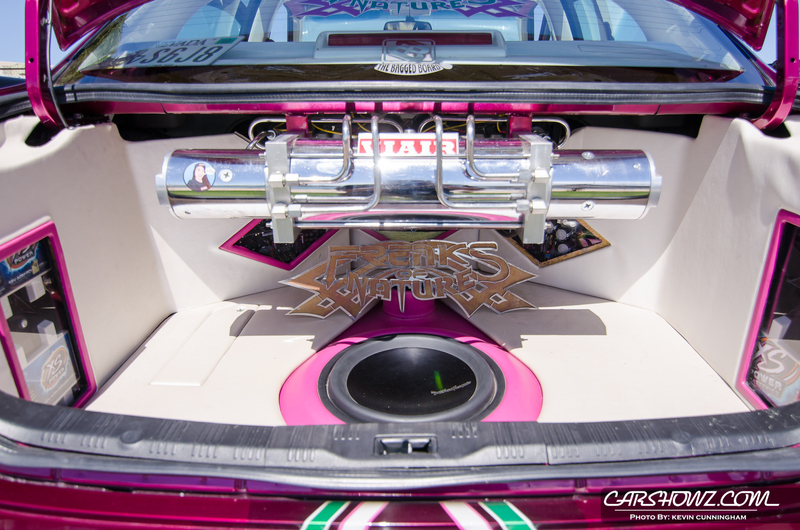 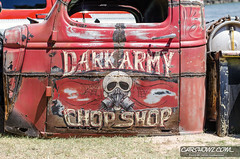 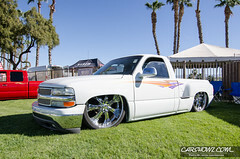 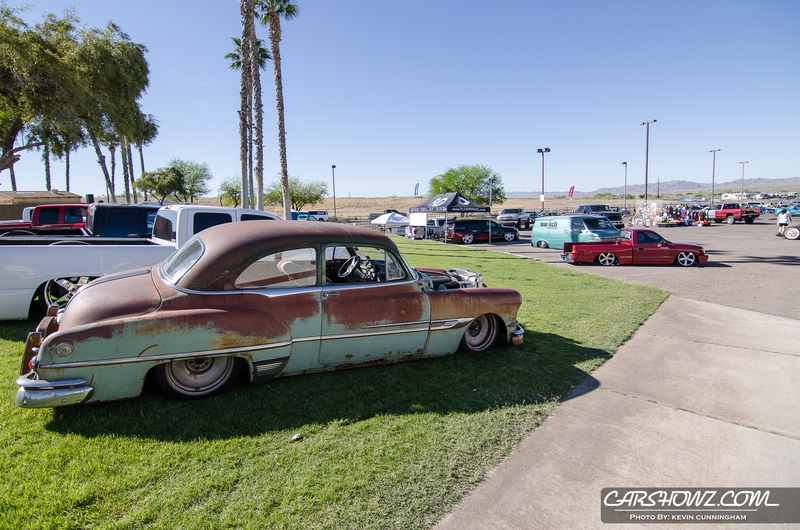 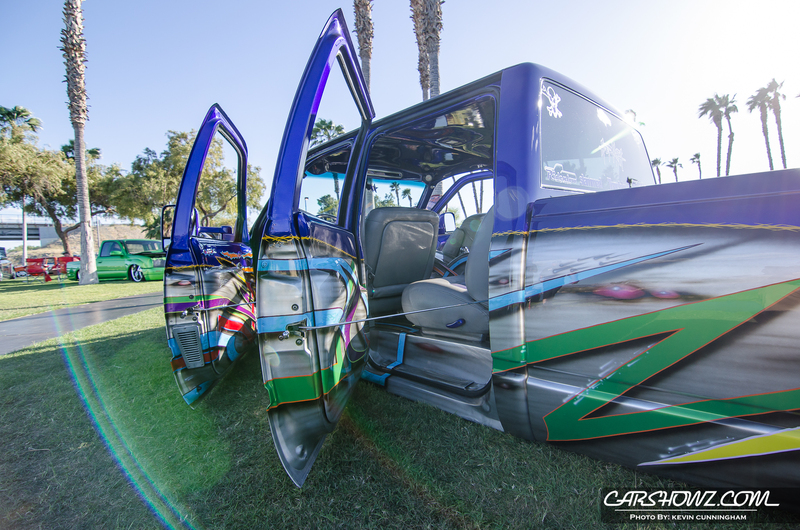 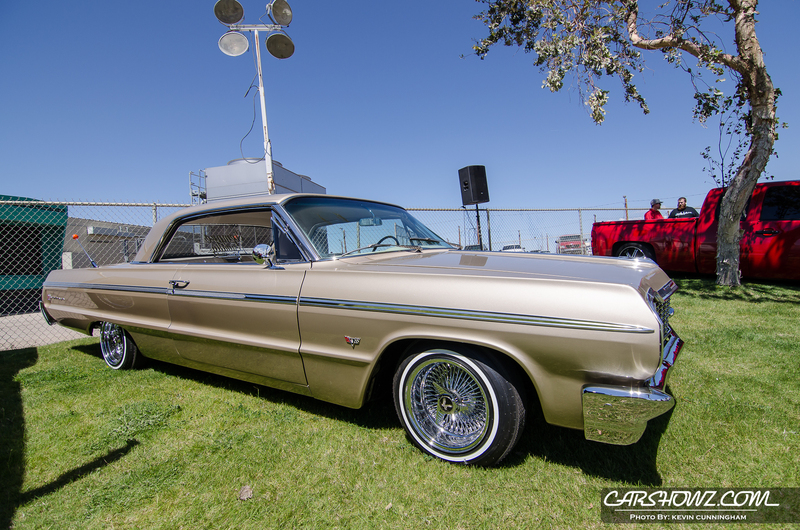 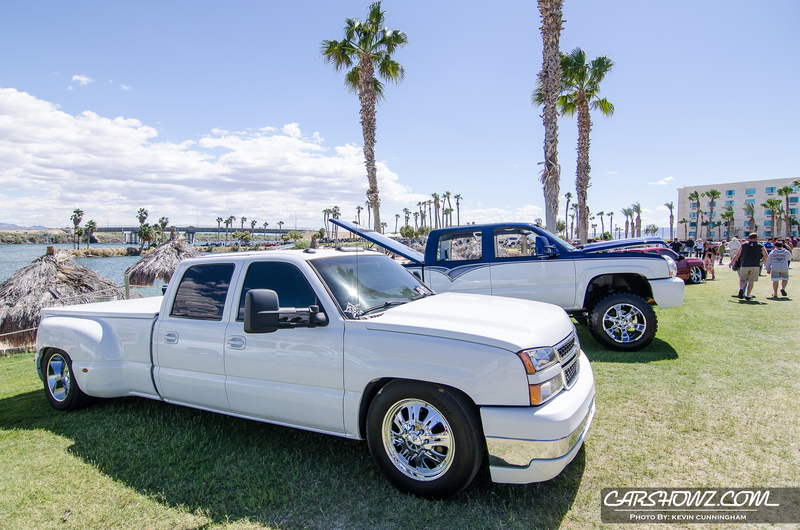 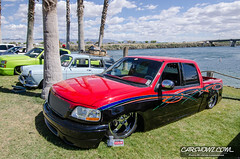 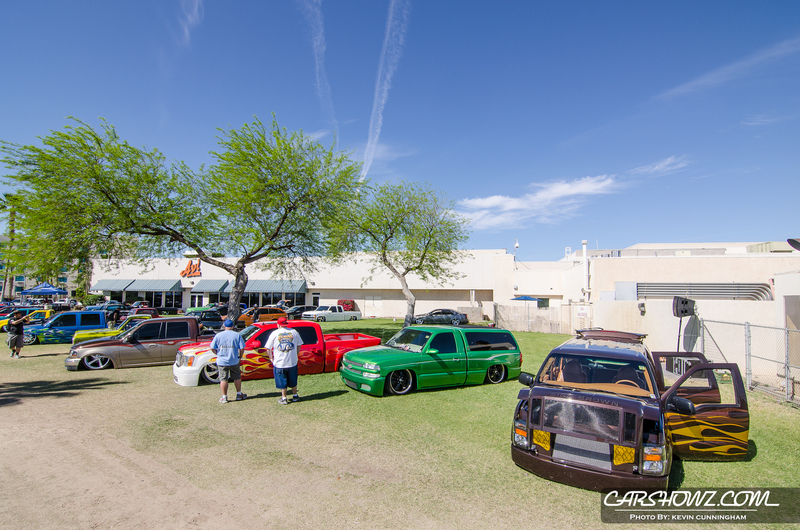 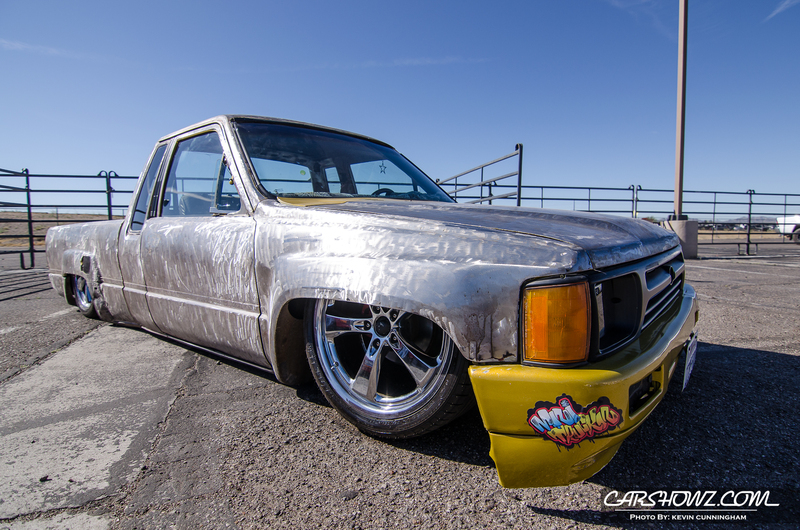 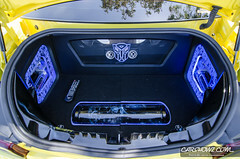 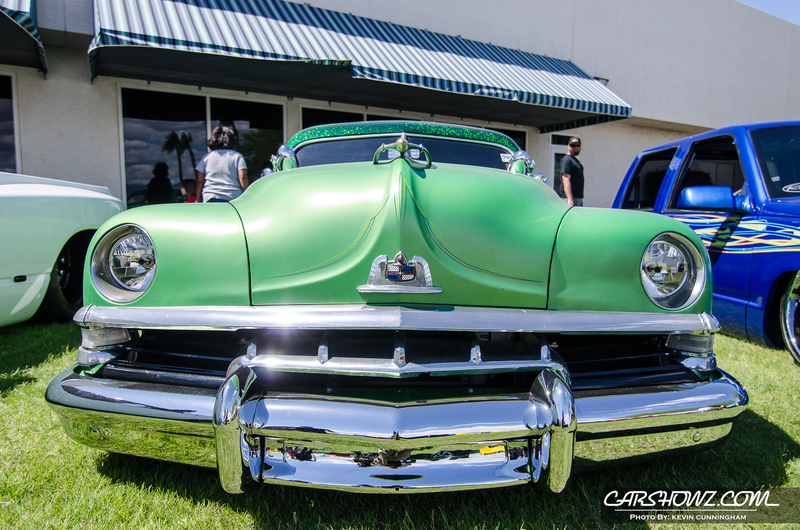 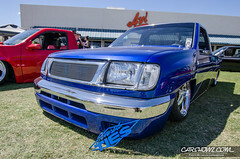 The 20th Annual Show N Shine is focused on the custom truck and car community (bagged and body dropped vehicles that lay frame or body) and is a pre-registration event only. 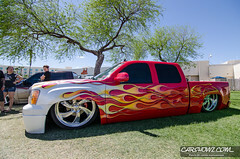 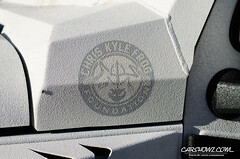 Kevin Cunningham is making the 5 hours drive from Arizona to attend and cover the event. 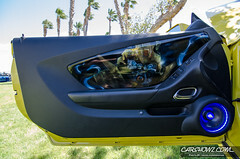 Stay tuned here for post coverage review, photos and more. 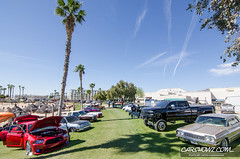 For more information check out the show info at the bottom of this post. 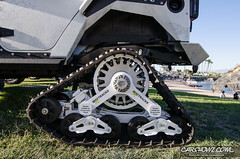 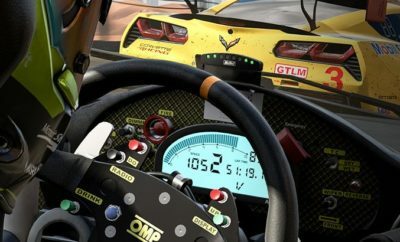 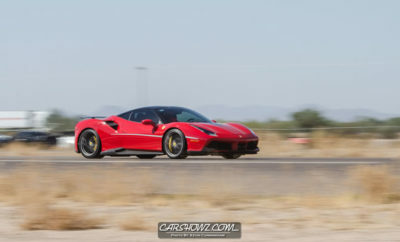 Picture this – You’re driving through the Arizona deserts and mountains for four and a half hours. Your body is cramped, you’re in desperate need of a restroom, and your car is at less than an eighth of a tank of gas. 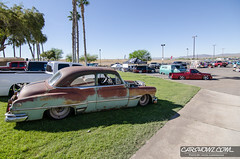 You finally hit Bullhead City but, all that means is traffic slows from the normal 80 mph down to 40. 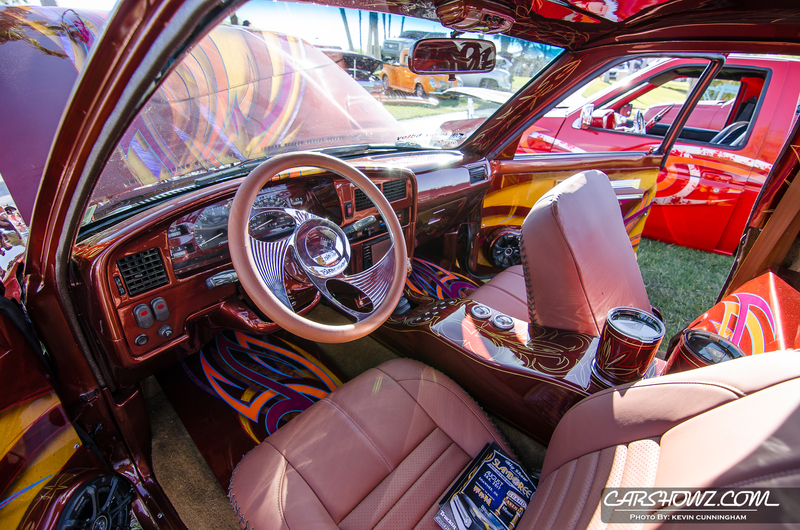 You’re ready to get the hell out and stretch but you’re almost to your destination. 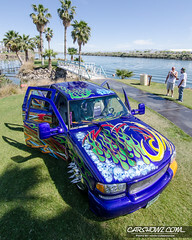 Then you make a right turn onto a dusty road that takes you over a bridge spanning the Colorado River. 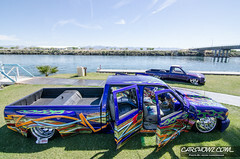 As you do, your GPS squawks in a robotic voice “Welcome to Nevada.” You look to your right and across the river at the western bank and you see the show grounds. 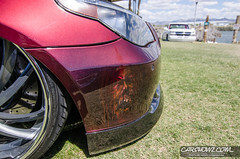 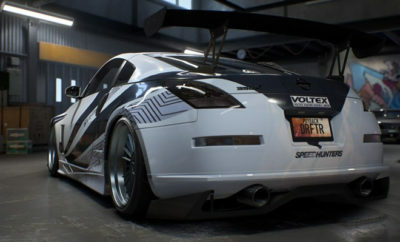 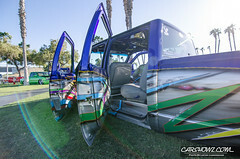 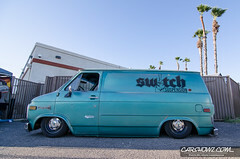 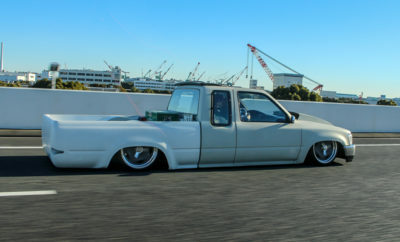 You think you can make out a couple slammed and painted duallies. 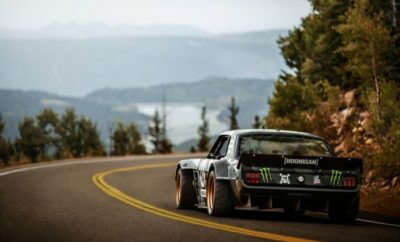 You roll your dust-caked window down to get a better view and instantly you hear chest-rattling bass and you know the whole trip wasn’t a mistake. 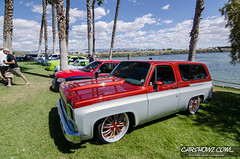 Even without setting foot on the green-grass banks of the Colorado you know that this show will be worth it. 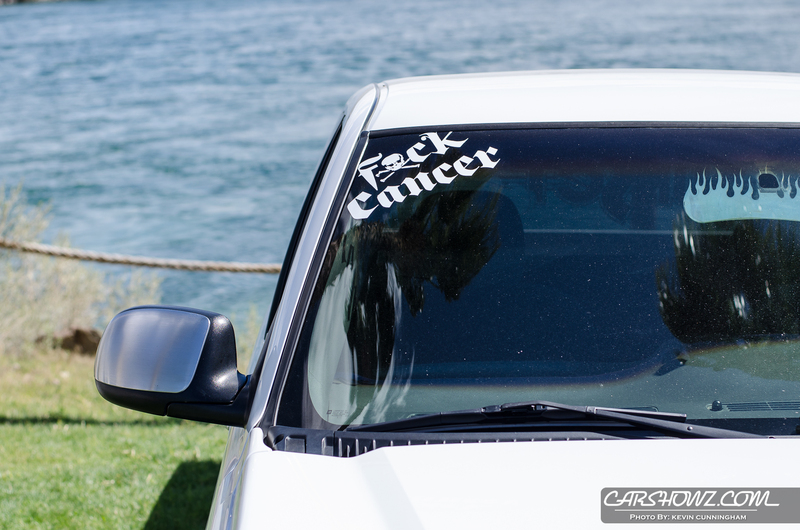 That was exactly my experience as I rolled into the parking lot of the Avi Resort and Casino for the Forbidden Fantasy Show N Shine 2017 Presented by Viair. 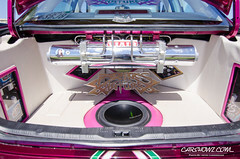 I opened my door as the DJ started bidding spectators good morning over the PA system. 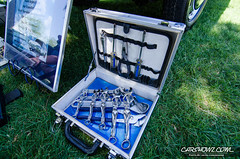 Full of nerves, as is typical for me at a new show, I got out of my car and started getting all my gear together. 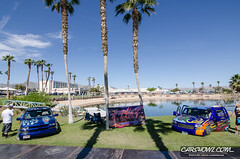 The Avi Resort and Casino is located in Nevada almost all the way to the point where that state meets Arizona and California. 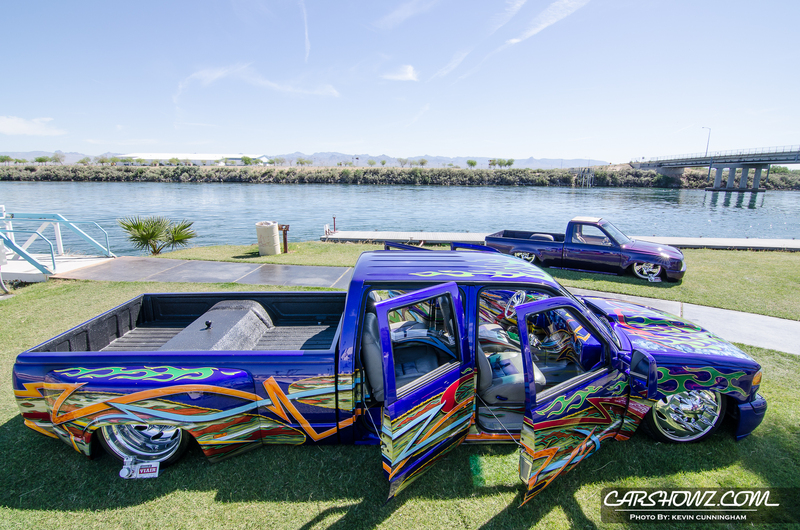 It sits directly on the west bank of the Colorado River and, to be completely honest, it was probably one of the best show locations I’ve ever been to. There were towering palm trees and sporadic clouds that set the backdrop for well-manicured green grass on which dozens of high-quality builds were parked. 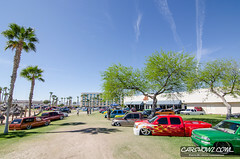 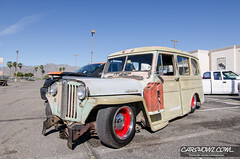 The entrance to the show was through a side parking lot where many of the vendors and “under construction” vehicles were located. 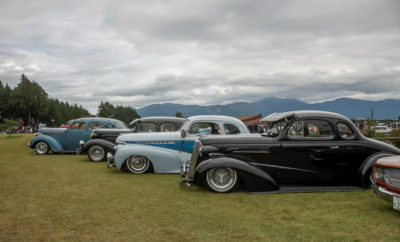 That’s not to say there weren’t some beauties out there, because there were. I walked past a Dodge Ram that seemed like it had a 30 foot lift and was also ground zero for the earth-shaking bass I had heard driving in. 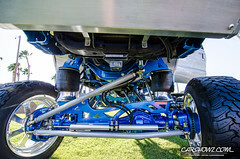 There were truck frames laying on pavement as far as the eye could see and people milling around in small, friendly groups. I walked through the parking lot and onto the grass. 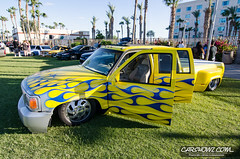 The show organizer had said that this show was more focused on quality over quantity and he wasn’t wrong. 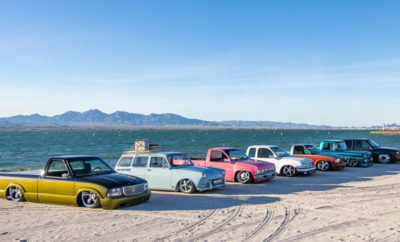 What struck me most about this show were the groupings of club vehicles. 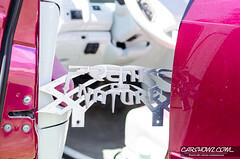 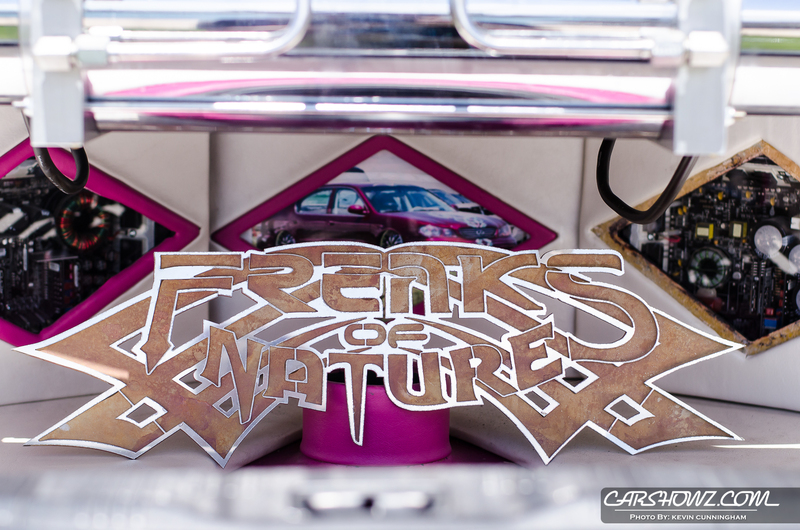 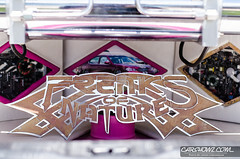 On hand were Freaks of Nature, No Regrets, Severed Ties, Sunset, AZDimes, Xplizit, Toyota Dudes, Aftermath, Xtreme Lowz, and more. 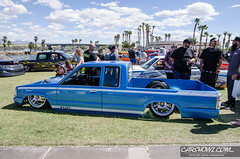 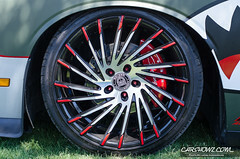 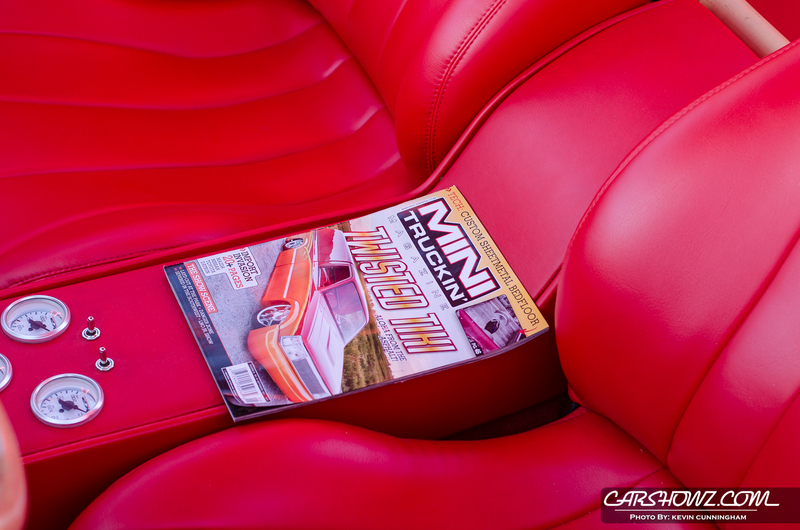 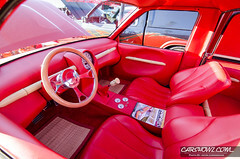 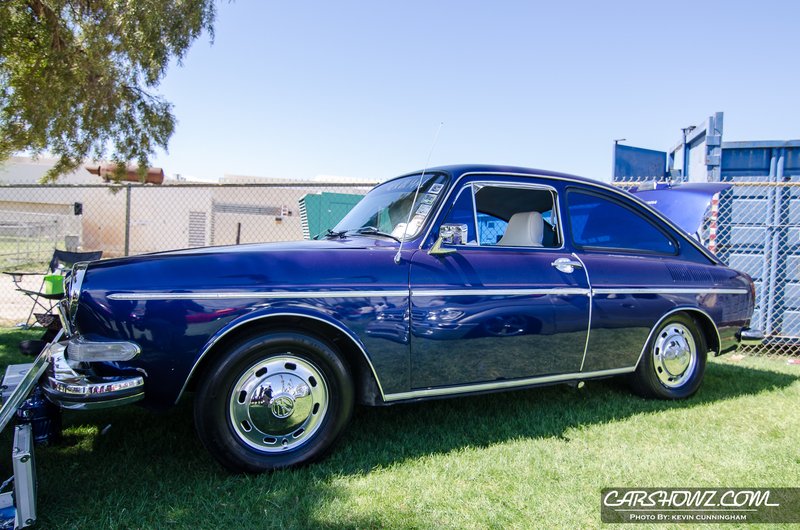 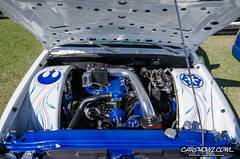 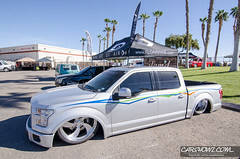 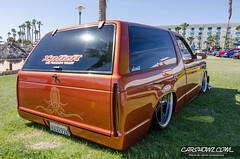 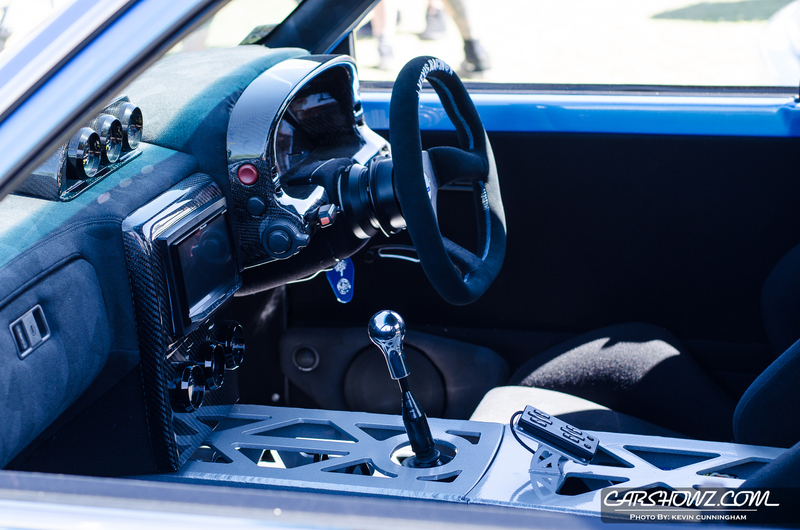 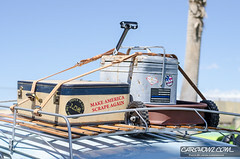 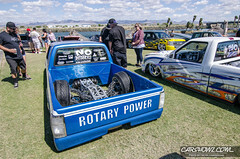 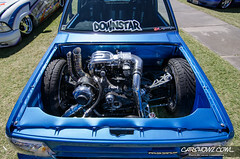 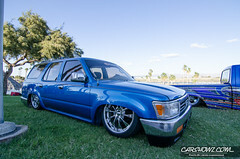 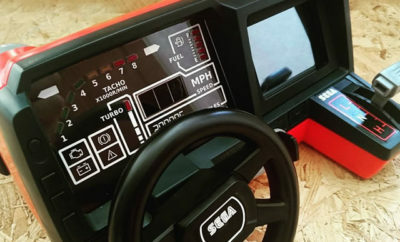 The only time I’ve seen something similar is at the Ocean City Car and Truck Show when East Coast Minis had a collective showing of their trucks. 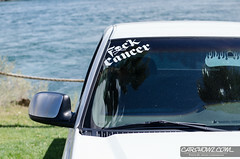 That’s not to say it doesn’t happen all the time, it just means I’ve rarely seen it. 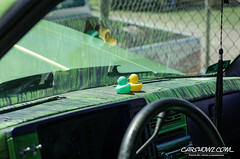 What that did for this show was create an actual family atmosphere. Hugs and handshakes were a dime a dozen. 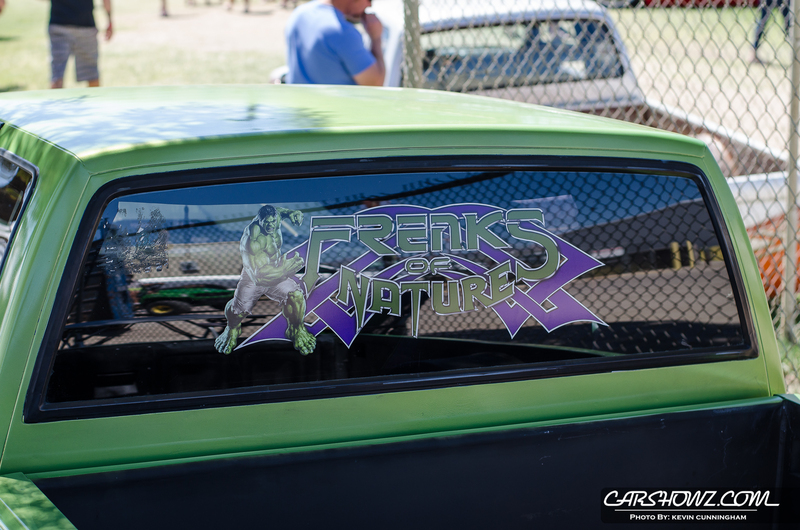 I never felt like an outsider and that says something about the show. 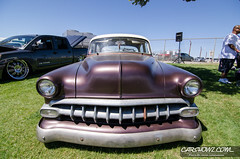 Conversations and laughs came easily and I saw a smile on almost everyone’s face. 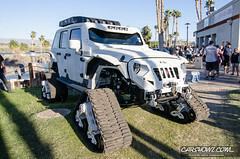 The concentration of absolutely spectacular builds was mind-numbing. 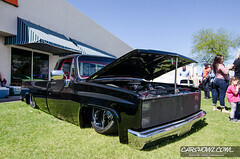 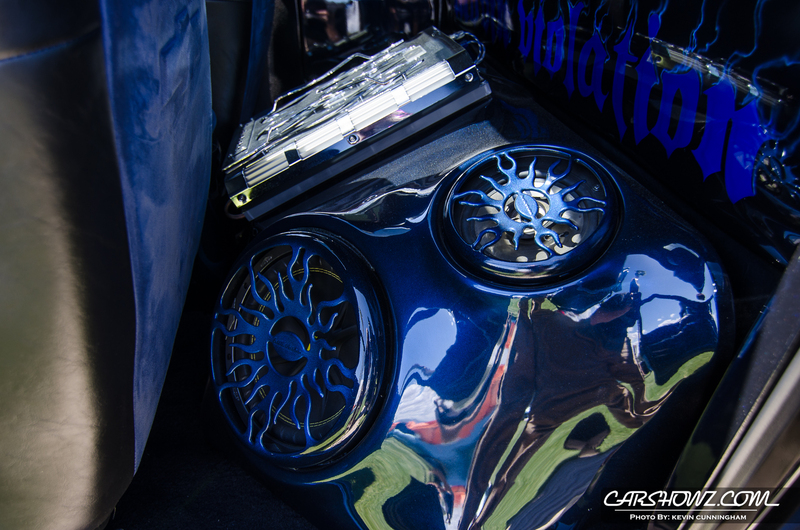 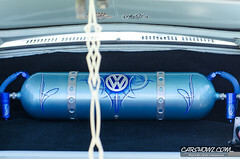 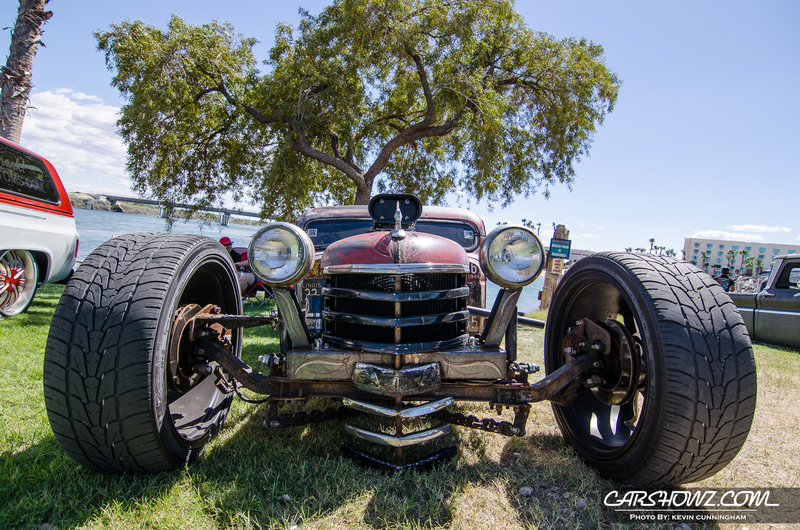 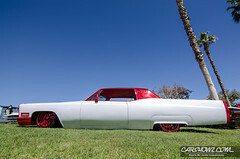 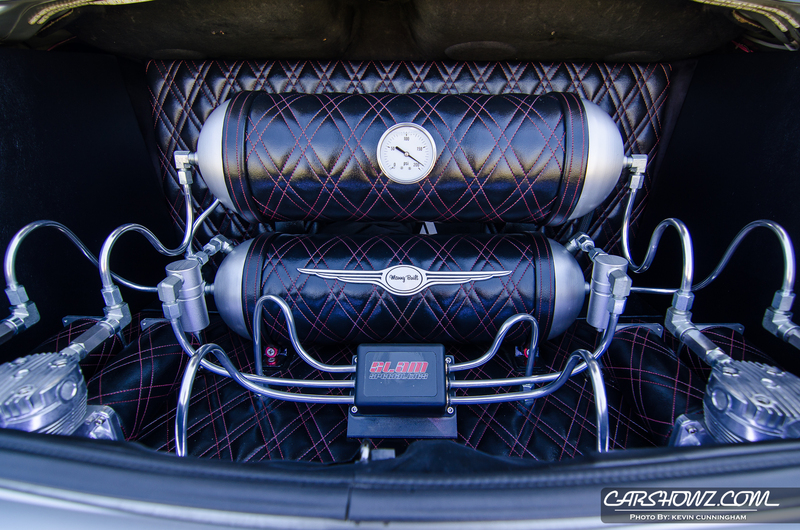 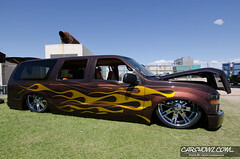 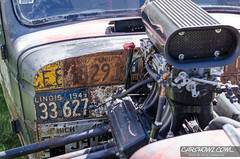 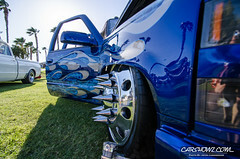 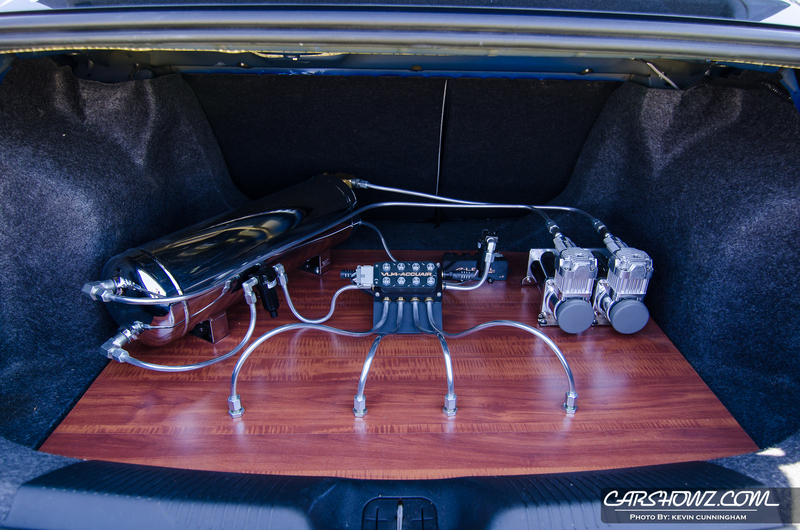 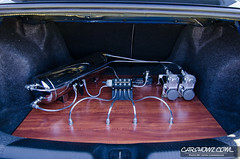 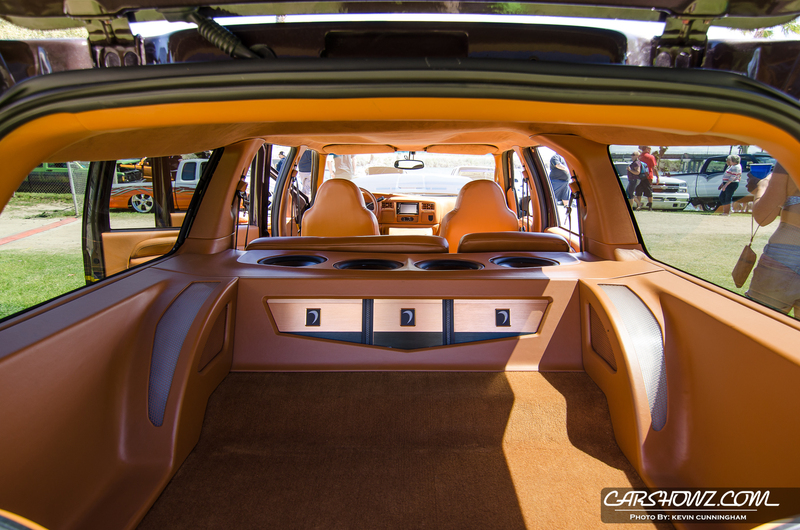 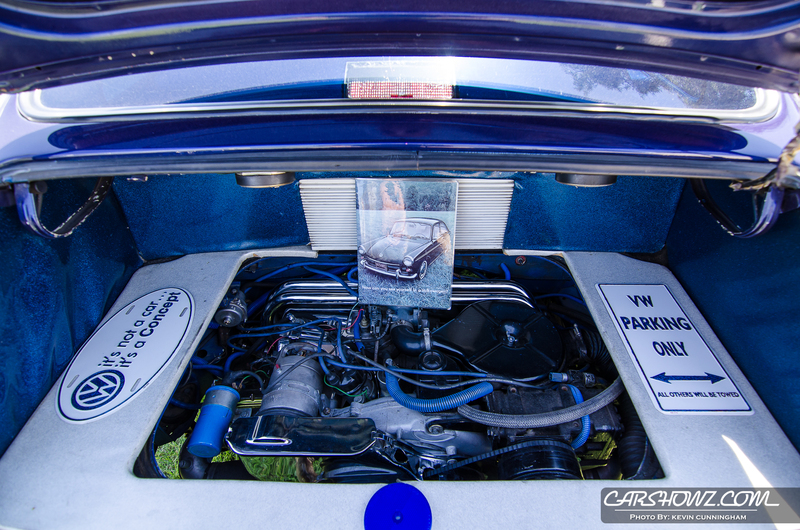 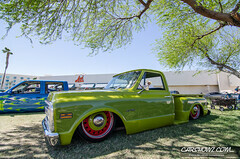 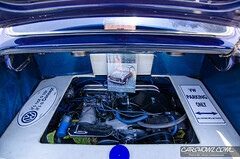 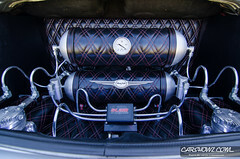 From duallies and classics to rat rods and American muscle; this show was stellar. 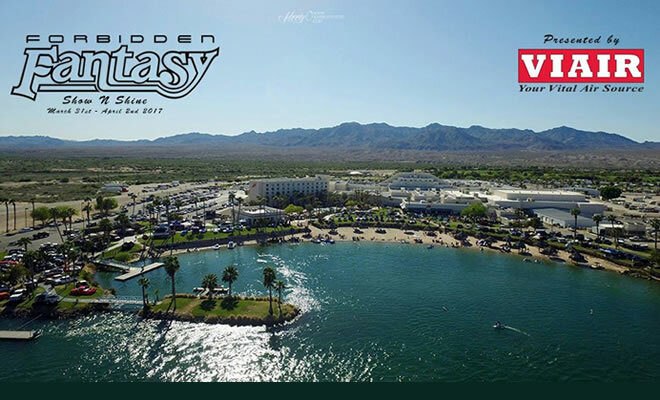 What else can I say besides the fact that Forbidden Fantasy provided beautiful rides under beautiful skies at a beautiful venue. 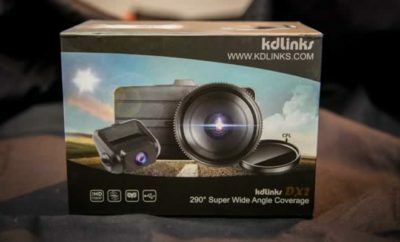 It’s an amazing show that really knows how to bring the quality. 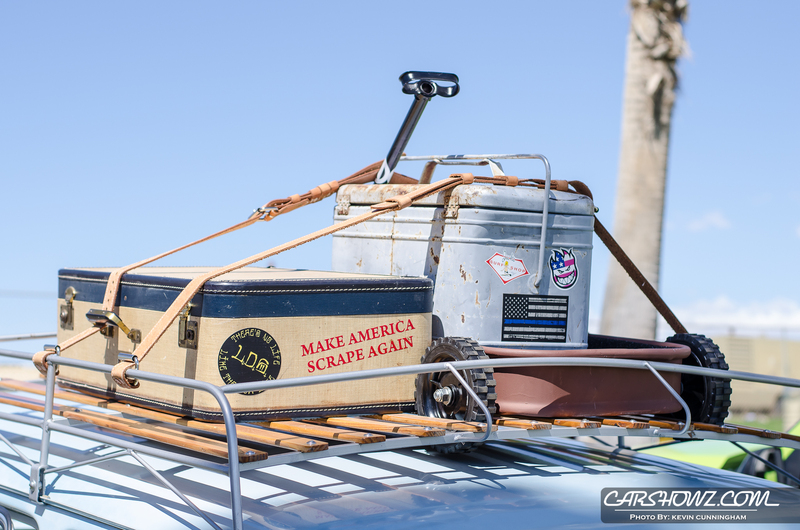 For now, I’m going to let the coverage do the talking.